Indicate by check mark whether the registrant is a large accelerated filer, an accelerated filer, a non-accelerated filer, or a smaller reporting company, or an emerging growth company. See definition of “large accelerated filer,” “accelerated filer”, “smaller reporting company” and “emerging growth company” in Rule 12b-2 of the Exchange Act. The aggregate market value of the 18,000,115,shares of Common Stock of the registrant held by non-affiliates of the registrant on July 31, 2017, the last business day of the registrant’s second fiscal quarter, computed by reference to the closing sale price of such stock on the NASDAQ Global Select Market on that date was $190,621,218. At March 31, 2018, there were 19,917,043 shares of the Registrant’s Common Stock outstanding. Portions of the following document are incorporated by reference into the indicated parts of this report: Definitive Proxy Statement for the 2018 Annual Meeting of Stockholders to be filed with the Commission pursuant to Regulation 14A. Layne Christensen Company (“Layne”, “our”, “we” or “us”) is a leading global water management and services and drilling company, with more than 130 years of industry experience. We provide responsible, sustainable, integrated solutions to address the world’s water, minerals and infrastructure challenges. Protecting essential natural resources is a continuing focus within Layne. Our customers include government agencies, investor-owned utilities, industrial companies, multi-national mining companies, consulting engineering firms, oil and gas companies, power companies and agribusiness. We operate approximately 52 sales and operations offices located throughout North America, Brazil and through our affiliates in Latin America. We maintain executive offices at 1800 Hughes Landing Boulevard, Suite 800, The Woodlands, Texas 77380. The telephone number is (281) 475-2600 and the website address is www.layne.com which is where you can find periodic and current reports, free of charge, as such material is filed with the Securities and Exchange Commission (“SEC”). We manage for our customers, water and related infrastructure throughout its lifecycle, including supply, treatment, delivery, maintenance and rehabilitation. Throughout each phase, we work to ensure compliance with complex state and federal regulations and to meet increasingly high demand for quality, reliability and efficiency. Our mineral services teams extract representative samples that accurately reflect the underlying mineral deposits for our global mining customers and also offer mine water management services consisting of vertical, large diameter wells for sourcing and dewatering, and horizontal drains for slope de-pressurization. On February 13, 2018, we entered into a definitive agreement (the “Merger Agreement”) whereby Granite Construction Incorporated will acquire all of the outstanding shares of Layne in a stock-for-stock transaction with each share of Layne common stock exchanged for 0.27 shares of Granite common stock. The transaction is subject to the approval by Layne’s shareholders and other customary closing conditions. During the first quarter of fiscal year ended January 31, 2018, we completed the sale of substantially all of the assets of our Heavy Civil business. The results of operations related to the Heavy Civil business have been classified as discontinued operations for all periods presented. Unless noted otherwise, discussion in this Form 10-K pertain to continuing operations. See Note 16 to the Consolidated Financial Statements for a discussion of discontinued operations. As of fiscal year ended January 31, 2018, we operate our business in three segments: Water Resources, Inliner and Mineral Services. Each of our segments has major customers; however, no single customer accounted for 10% or more of revenues in any of the past three fiscal years. See Note 17 to the Consolidated Financial Statements for financial information pertaining to the operations and geographic spread of the segments and foreign operations. We provide a full suite of water-related products and services throughout the United States (“U.S.”), including hydrologic design, source of supply exploration, well and intake construction, including radial collector wells (Ranney® Collector Wells) and well and pump maintenance and rehabilitation. The radial collector well group specializes in the design and turnkey infrastructure of high capacity water supply systems including radial collector wells, surface water intakes, infiltration galleries, riverbank filtration and sea water systems. Collector wells which are less intrusive on the environment, typically combine high yields with cost-effective operating and maintaining costs. We also offer water treatment equipment and engineering services, providing systems for the treatment of regulated and nuisance contaminants, specifically iron, manganese, hydrogen sulfide, arsenic, radium, nitrate, perchlorate and volatile organic compounds. Water supply solutions for government agencies, industry and agriculture require the integration of hydrogeology and engineering with proven knowledge and application of drilling techniques. The drilling methods, size and type of equipment required depend upon the depth of the wells and the geological formations encountered at the project site. We have extensive well archives in addition to technical personnel who determine geological conditions and aquifer characteristics. We provide feasibility studies, analyze the results and define the source, depth and magnitude of an aquifer. We can estimate recharge rates, recommend well design features, plan well field design and develop water management plans. To conduct these services, we maintain a staff of professional employees including engineers, geologists and hydrogeologists. Our involvement in the initial drilling of wells positions us to win follow-up maintenance and rehabilitation business. Such rehabilitation is periodically required during the life of a well, as groundwater may contain bacteria, iron, high mineral content, or other contaminants and screen openings may become blocked, reducing the capacity and productivity of the well. We offer complete diagnostic and rehabilitation services for existing wells, pumps and related equipment through our network of regional offices. In addition to our well service rigs, we have equipment capable of conducting downhole closed circuit televideo inspections, one of the most effective methods for investigating water well problems, enabling us to effectively diagnose and respond quickly to well and pump performance problems. Our personnel can perform a variety of well rehabilitation techniques, using both chemical and mechanical methods. We also have the capability and inventory to repair, in our own machine shops, most water well pumps, regardless of manufacturer, as well as to repair well screens, casings and related equipment such as chlorinators, aerators and filtration systems. Water Resources also offers investigative services to assist in assessing, monitoring and characterizing water quality and aquifer parameters. Water Resources provides water management solutions to the oil and natural gas industry’s exploration and production water related challenges. Our water management services specialize in hydrogeological assessments and sourcing, transfer, storage and treatment. Our Water Midstream business provides responsible water lifecycle solutions to energy producers in the Delaware Basin in West Texas through the creation of sustainable high-capacity water delivery infrastructure. Operations include our Hermosa Pipeline system, a 26 mile pipeline near Pecos, Texas, delivering up to 175,000 barrels of non-potable water per day for use in energy drilling and completion activities, water storage facilities and the exclusive right to develop non-potable water resources for use in energy drilling and completion activities on approximately 88,000 acres owned by the State of Texas General Land Office in Reeves and Culberson counties. In Water Resources, our customers are typically government agencies, national and regional consulting firms engaged by federal and state agencies and local operations of agricultural, industrial and energy businesses. The term “government agencies” includes federal, state and local entities. Demand for water solutions are expected to grow as government agencies, industrial, agricultural and energy companies compete for increasingly limited water resources. The combination of tightening regulations and water scarcity has resulted in increasingly sophisticated water consumers and this in turn has created opportunities for the introduction of long-term sustainable methods and technologies such as aquifer recharge, water re-use, injection wells and zero-liquid discharge treatment systems. Injection wells place fluid deep underground into porous rock formations, and we have seen increasing market demand driven by new regulations and the need to economically dispose of waste associated with municipal and industrial water treatment. Main drivers for water supply and treatment include shifting demographics, new residential and commercial development, deteriorating water quality and infrastructure that supplies our water, increasing water demand from industrial expansion, increasing amounts of water used in oil and gas production, stricter regulation and new technology that allows us to achieve new standards of quality. Well and pump rehabilitation demand depends on the age and application of the equipment, the quality of material and workmanship applied in the original well infrastructure and changes in depth and quality of the groundwater. The demand for well and pump rehabilitation in the public market is highly influenced by municipal budgets. The U.S. water well drilling and rehabilitation markets are highly fragmented, consisting of several thousand regional and local contractors. Water well drilling work is usually obtained on a competitive bid basis for government agencies, while work for industrial customers is obtained both on a competitive bid and negotiated basis. The majority of these water well drilling contractors are primarily involved in drilling low-volume water wells for agricultural and residential customers, markets in which we do not generally participate. Competition in the energy market is primarily from local or regional small and mid-sized contractors. There are no proprietary technologies or other significant factors that prevent other firms from entering these local or regional markets or from consolidating into larger companies more comparable in size to us. Well and pump rehabilitation work is typically negotiated on an emergency basis or within a relatively short period of time. Those companies with available rigs and the requisite expertise have a competitive advantage by being able to respond quickly to repair requests. Inliner is an infrastructure solutions provider offering a wide range of rehabilitation techniques and services for wastewater, storm water and process sewer pipeline networks. The foundation of our services remains our proprietary Inliner® and Inliner STX® cured-in-place pipe (“CIPP”) products. These products allow us to rehabilitate aging and deteriorated infrastructure to provide structural rebuilding as well as infiltration and inflow reduction. The trenchless nature of the products reduces rehabilitation costs, minimizes environmental impact and reduces or eliminates surface and social disruption. Since Inliner’s start as the first U.S. licensee of the Inliner® technology in 1991, we have expanded and have come to own and operate Inliner Technologies and Liner Products, the technology company and lining tube manufacturer, respectively. This vertical integration gives us control of the Inliner® product from raw material purchases to product installation. In our 27 year history, we have successfully installed more than 25 million feet of 4 to 96-inch CIPP throughout the U.S. in traditional round as well as non-circular pipe geometries. Inliner’s lining tube manufacturing, design, saturation (both felt and ultra violet (“UV”)), and installation techniques are all ISO 9001:2015 certified, bringing an added level of quality control to our products and offered services. Inliner has the ability to supply both traditional felt-based or composite CIPP lining tubes cured with water or steam, and fiberglass-based lining tubes cured with ultraviolet light. We continue to offer outside sales of dry as well as install-ready, resin-saturated felt liners and install-ready, resin-saturated fiberglass/UV liners to other marketplace installers. While Inliner focuses on CIPP, we also provide full system renewal and infrastructure management services. Renewal methods include Janssen structural renovation of service lateral connections, traditional excavation and replacement and manhole renewal. Inliner’s expertise, experience and customer-oriented contracting combined with an ability to provide a diverse line of products and services differentiates us from other rehabilitation contractors and allows Inliner to provide clients with single source accountability for rehabilitative and large construction type projects. Inliner’s primary customer base is comprised of municipalities, operating groups of municipal systems and local operations of industrial businesses. Customers for both felt and fiberglass based tube supplied through Liner Products remain predominantly U.S. based. Inliner’s current geographic reach stretches from the east coast westward to the Rocky Mountains. Many of the drivers for wastewater, storm water and process sewer rehabilitation demand are largely a function of deteriorating urban infrastructure compounded by population growth and deteriorating water quality. U.S. Environmental Protection Agency (EPA) mandated consent decrees continue to drive the larger rehabilitation programs and force those entities to address infiltration and inflow of groundwater into damaged or leaking sewer lines, within defined timelines. These factors and enforcement of stricter regulation drive the rehabilitation market to continue to deploy technologies like CIPP and combine them with new technologies all while continuing to focus on the achievement of lasting solutions and high quality standards. The U.S. competitive landscape remains fragmented with a limited number of CIPP providers able to provide nationwide coverage. Numerous, smaller scale, regionalized competitors in both the felt and UV arenas exist. Municipal work is most often obtained on a competitive bid basis with some exceptions of qualification-based or design build proposals used predominantly in larger, longer-term and more complex projects. Multi-year contracts, although typically obtained at least initially through a structure that involves a competitive pricing element, continue to exist and remain a focal point for Inliner. Industrial or private work is only a small percentage of revenue and is a mix of competitive bid and negotiated. Larger competitors share the same vertical integration-tube manufacturing/assembly, resin-saturation (wetout) and installation- as Inliner, while most of our smaller competitors rely on third party tube supply and wetout. This readily-available, saturated tube supply for both traditional, heat cured, felt based products and UV cured fiberglass products combined with the ability to not have to construct and permit saturation facilities, allows smaller competitors to continue to enter and remain in the CIPP market. The smaller installers often perform CIPP as a side product to complement other work they perform. Despite widespread competition, Inliner remains one of the most diversified providers in the industry by supplying a good quality, competitively priced group of core products and then complementing that product group with ancillary product offerings, subcontracting partnerships and construction management services all designed to provide broader solutions that go beyond just CIPP installation. Before investing heavily in development to extract minerals, global mining and junior mining companies hire companies such as Mineral Services to extract rock and soil samples for analyses of mineral content and grade. Mineral Services conducts drilling activities, including all phases of core drilling, reverse circulation, dual tube, hammer and rotary air-blast methods. Samples extracted must be free of contamination and accurately reflect the location and orientation of underlying mineral deposits. We also drill to support the definition of ore bodies to maximize the efficiency of mining operations. Mines often face water problems; with either too little water to supply processing needs or too much water, causing concerns with flooding and/or mine stabilization. Layne’s mine water management services utilize our expertise at completing high yield wells to find new sources of water or to construct wells that efficiently de-water areas for depressurization to increase slope stability. Mineral Services also has ownership interests in foreign affiliates operating in Latin America that form our primary presence in Chile and Peru. Mineral Services manages interests in our foreign affiliates, where we do not have majority ownership or operating control, through regular management meetings and analysis of key operating and financial information. The foreign affiliates are engaged in similar operations to Mineral Services and also the manufacture and supply of drilling equipment, parts and supplies. The mining industry has experienced improvement with the increase in demand for mineral exploration over the past year. This improvement has been driven by strengthening commodity prices of base and precious metals. Mineral Services has continually adjusted our operations to respond to the industry’s market conditions, which are cyclical in nature. Our safety record and ability to re-deploy assets quickly positions Mineral Services well to respond to such opportunities. Mineral Services customers are major gold and copper producers and to a lesser extent, other base metal producers including iron ore. Mineral Services’ largest customers are multi-national corporations headquartered in the U.S., Brazil, Europe and Canada. The success of Mineral Services is closely tied to global commodity prices and demand for the products of our global mining customers. Our primary markets are in North America, Brazil and through our affiliates in Latin America. See Item 1A, Risk Factors for a discussion of the risks associated with operating in these foreign countries. Demand for mineral exploration drilling is driven by the need to identify, define and develop underground base and precious mineral deposits. Factors influencing the demand for mineral-related drilling services include the absolute price level and volatility in commodity prices, international economic and political conditions, inflation, foreign exchange levels, the economic feasibility of mineral exploration and production, the discovery rate of new mineral reserves and the ability of mining companies to access capital for their activities. The mineral exploration market is dependent on financial and credit markets being readily available to fund drilling and mining programs. In addition, mining companies’ ability to raise capital for their operations through other avenues, which traditionally have been available to them, is dependent on market pricing trends for base and precious metals. Mineral Services competes with a number of drilling companies, as well as vertically integrated mining companies that conduct their own exploration drilling activities. In the mineral exploration drilling market, Mineral Services competes based on price, technical expertise and reputation. Mineral Services work is typically performed on a private bid basis. We identify potential projects from a variety of sources. After determining which projects are available, we make a decision on which projects to pursue based on factors such as client history, project size, duration, availability of personnel, current backlog, profitability expectations, risk profile, type of contract, prior experience, source of project funding and geographic location. We execute our contracts through a variety of methods, including cost-plus, fixed-price, time and material, day rate, unit price or some combination of these methods. Customers may consider price, technical capabilities of equipment and personnel, safety record and reputation, among other factors. Fixed-price contracts have historically been used in competitively bid public water well and specialty contracts. These contracts commit us to provide all of the resources required to complete a project for a fixed sum. Usually, fixed-price contracts transfer more risk to us. Most of our contract revenues and costs are recognized using the percentage of completion method. For each contract, we regularly review contract price and cost estimates as the work progresses and reflect adjustments in profit proportionate to the percentage of completion of the related project in the period when we revise those estimates. To the extent that these adjustments result in a reduction or elimination of previously reported profits with respect to a project, we recognize a charge against current earnings which could be material. Backlog represents the dollar amount of revenues we expect to recognize in the future from contracts that have been awarded. We include a project in backlog at such time as contracts are executed or notices to proceed are obtained, depending on terms of the contract. Backlog amounts include anticipated revenues associated with the original contract amounts, executed change orders and any claims that may be outstanding with customers for which recovery is considered probable. The backlog figures are subject to modifications, alterations or cancellation provisions contained in the various contracts. Historically, those provisions have not had a material effect on the consolidated financial statements. Backlog may not be indicative of future operating results. There have been no changes in the methodology used to determine backlog during the fiscal years ended January 31, 2018 and 2017. Backlog is not a measure defined by generally accepted accounting principles in the United States (“GAAP”) and is not a measure of profitability. Our method for calculating backlog may not be comparable to methodologies used by other companies. Layne’s backlog of uncompleted contracts at January 31, 2018, was approximately $178.6 million compared to $166.6 million at January 31, 2017. The following table provides an analysis of backlog by segment for the fiscal year ended January 31, 2018. As of January 31, 2018, approximately 11% of total backlog is not reasonably expected to be completed during the next twelve months. Of Layne’s total backlog of $178.6 million as of January 31, 2018, approximately $6.3 million relates to active contracts that are in a loss position. The remaining contracts in backlog have future revenues which are expected to equal or exceed costs when recognized. We can provide no assurance as to the profitability of the contracts reflected in backlog. It is possible that the estimates of profitability could increase or decrease based on changes in productivity, actual downtime and the resolution of change orders and any claims with customers. As of January 31, 2018, there were no significant contracts in backlog not moving forward as originally scheduled. During the fiscal years ended January 31, 2018 and 2017, there were no significant cancellations of contracts previously included in backlog and no significant changes in anticipated gross margin trends based on current backlog. The domestic drilling and infrastructure services activities and related revenues and earnings tend to decrease in the winter months when adverse weather conditions interfere with access to project sites. Additionally, drilling activities and services typically slow down during Thanksgiving, Christmas and New Year holidays. As a result, revenues and earnings in our first and fourth fiscal quarters tend to be less than revenues and earnings in the second and third fiscal quarters. Each of our segments is subject to various laws and regulations relating to the protection of the environment and worker health and safety. In addition, each segment is subject to its own unique set of laws and regulations imposed by federal, state, local and foreign laws relating to licensing, permitting, approval, reporting, bonding and insurance requirements. Management believes that our operations comply in all material respects with applicable laws and regulations and that the existence and enforcement of such laws and regulations have no more restrictive effect on the method of operations than on other similar companies in the industries in which we operate. Layne has internal procedures and policies that management believes help to ensure that our operations are conducted in compliance with current regulations. We are subject to the reporting requirements of the Securities and Exchange Act of 1934, as amended (“the Exchange Act”), the Sarbanes-Oxley Act of 2002 (the “Sarbanes-Oxley Act”), the Dodd-Frank Wall Street Reform and Consumer Protection Act (the “Dodd-Frank Act”), the listing requirements of NASDAQ and other applicable securities rules and regulations. Our operations are subject to stringent and complex federal, state, local and foreign environmental laws and regulations. These include, for example, (1) the federal Clean Air Act and comparable state and foreign laws and regulations that impose obligations related to air emissions, (2) the federal Resource Conservation and Recovery Act and comparable state and foreign laws that regulate the management of waste from our facilities, (3) the Comprehensive Environmental Response, Compensation and Liability Act of 1980 (“CERCLA”) and comparable state and foreign laws that regulate the cleanup of hazardous substances that may have been released at properties owned or operated by us, our predecessors or locations where we or our predecessors sent waste for disposal and (4) the federal Clean Water Act and the Safe Drinking Water Act and analogous state and foreign laws and regulations that impose detailed permit requirements and strict controls regarding water quality and the discharge of pollutants into waters of the U.S. and state and foreign waters. Such regulations impose permit requirements, effluent standards, waste handling and disposal restrictions and other design and operational requirements, as well as record keeping and reporting requirements, upon various aspects of Layne’s businesses. Some environmental laws impose liability and cleanup responsibility for the release of hazardous substances regardless of fault, legality of original disposal or ownership of a disposal site. Any changes in the laws and regulations governing environmental protection, land use and species protection may subject us to more stringent environmental control and mitigation standards. In addition, these and other laws and regulations may affect many of our customers and influence their determination whether to engage in projects which utilize our products and services. As part of Layne’s adherence to environmental laws and regulation, we focus on sustainability. Our employees contribute to the economic and environmental sustainability of the communities in which we operate. We have made and will continue to make expenditures in our efforts to comply with these environmental requirements. Management does not believe that, to date, we have expended material amounts in connection with such activities or that compliance with these requirements will have a material adverse effect on our capital expenditures, earnings or competitive position. Our operations are also subject to various federal, state, local and foreign laws and regulations relating to worker health and safety. In many cases, a solid safety record is a requirement of doing business with our customers. The Occupational Safety and Health Administration ("OSHA”) establishes certain employer responsibilities, including maintenance of a workplace free of recognized hazards likely to cause death or serious injury, compliance with standards promulgated by OSHA and various recordkeeping, disclosure and procedural requirements. Various standards, including standards for notices of hazards and safety in excavation and demolition work may apply to our operations. The operations of Mineral Services are also subject to the Federal Mine Safety and Health Act of 1977 (the “Mine Act”). In addition to federal regulatory programs, all of the states and foreign governments in which Mineral Services operates have programs for mine safety and health regulation and enforcement. The Mine Act requires mandatory inspections of surface and underground mines and requires the issuance of citations or orders, as well as the imposition of civil penalties or criminal liability for violations of mandatory health and safety standards and record keeping requirements. The operation and registration of our motor vehicles are subject to various regulations, including those promulgated by the U.S. Department of Transportation (“DOT”), including rules on commercial driver licensing, controlled substance testing, medical and other qualifications for drivers, equipment maintenance and drivers’ hours of service. Many states require regulatory mandated construction permits which typically specify that wells, water and sewer pipelines and other infrastructure projects be constructed in accordance with applicable statutes. Our water treatment business is also subject to legislation and municipal requirements that set forth discharge parameters, constrain water source availability and set quality and treatment standards. Various state, local and foreign laws require that water wells and monitoring wells be installed by licensed well drillers. Many of the jurisdictions in which we operate require construction contractors to be licensed. We maintain well drilling and contractor’s licenses in those jurisdictions in which we operate and in which such licenses are required. In addition, we employ licensed engineers, geologists and other professionals necessary to the conduct of our business. In those circumstances in which we do not have a required professional license, we subcontract that portion of the work to a firm employing the necessary licensed professionals. Our operations are also subject to various permitting and inspection requirements and building and electrical codes. In Mineral Services, drilling also frequently requires environmental permits, which are usually obtained by our customers. We are subject to the Foreign Corrupt Practices Act (“FCPA”), which prohibits U.S. and other business entities from making improper payments to foreign government officials, political parties or political party officials. We are also subject to the applicable anti-corruption laws in the jurisdictions in which we operate, thus potentially exposing us to liability and potential penalties in multiple jurisdictions. The anti-corruption provisions of the FCPA are enforced by the Department of Justice (“DOJ”). In addition, the SEC requires strict compliance with certain accounting and internal control standards set forth under the FCPA. Failure to comply with the FCPA and other laws can expose us and/or individual employees to potentially severe criminal and civil penalties. Such penalties may have a material adverse effect on our business, financial condition and results of operations. We devote resources to the development, maintenance, communication and enforcement of our Business Code of Conduct, our anti-bribery compliance policies, our internal control processes and compliance related policies. We strive to conduct timely internal investigations of potential violations and take appropriate action depending upon the outcome of the investigation. Our property and equipment is covered in part by insurance and we believe the amount and scope of such insurance is adequate for the risks we face. In addition, we maintain general liability, excess liability and worker’s compensation insurance in amounts that we believe are consistent with industry practice. As is common practice in drilling and infrastructure services business, we are required at times to provide surety bonds as an additional level of security of our performance. We have surety arrangements with more than one surety. At January 31, 2018, we had approximately 2,178 employees, approximately 67 of whom were members of collective bargaining units represented by locals affiliated with major labor unions in the U.S. Management believes that its relationship with employees is satisfactory. In all of Layne’s operations, an important competitive factor is technical expertise; accordingly, Layne emphasizes the growth and development of its personnel. In addition, Layne emphasizes strict adherence to all health and safety policies and procedures. This emphasis encompasses developing site-specific safety plans, ensuring regulatory compliance and training employees in regulatory compliance and sound safety practices. Training consists of OSHA and/or Mine Safety and Health Administration (“MSHA”) training as required and as applicable. Layne provides this training through certified and/or qualified trainers. In addition to the training, the safety team is also responsible for preparing health and safety site specific plans and provides guidance and site analysis for the health and safety plans prepared by others. Many of our employees have extensive experience with Layne and our industries and have advanced academic backgrounds in agricultural, chemical, civil, industrial, geological and mechanical engineering, geology and metallurgy. Management believes that our size and reputation allows us to compete effectively for highly qualified professionals. Investing in our common stock is subject to risks and uncertainties. You should carefully consider the risks described below with all of the other information contained or incorporated by reference in this annual report on Form 10-K before deciding to invest in our common stock. Many of these risks are beyond our control and are driven by factors that often cannot be predicted. If any of the following risks actually occur, they may materially harm our business and our financial condition and results of operations. In this event, the market price of our common stock could decline and you could lose part or all of your investment. Demand for our services is subject to economic conditions and volatility in private industry and municipal and other governmental spending. This could materially and adversely affect our revenues, profits and our financial condition. During times of uncertain economic conditions, our customers may face budget shortfalls and may reduce or defer capital spending that could decrease the overall demand for our services. In addition, our customers may find it difficult to raise capital in the future. Levels of municipal spending particularly impact Water Resources and Inliner. Reduced tax revenue or user fee in certain regions, or inability to access traditional sources of credit, may limit spending and new development by municipalities or local governmental agencies, which in turn may adversely affect the demand for our services and reduce our revenue. Many of our customers, especially federal, state and local governmental agencies competitively bid their contracts. In addition, projects with negotiated contracts are also highly competitive. Our customers may also demand lower pricing as a condition of continuing our services. In addition, certain of our customers may be unable to pay us if they are unable to raise capital to fund their business operations, which would have an adverse effect on our revenue and cash flows. Volatility within the global commodity markets may negatively impact Mineral Services. Mineral exploration is highly speculative and is influenced by a variety of factors, including the prevailing prices for various metals (particularly gold and copper), which often fluctuate widely in response to global supply and demand, international economic trends, currency exchange fluctuations, expectations for inflation, speculative activities and political events. Volatility in the price of crude oil and natural gas may negatively impact our Water Midstream business. Crude oil and natural gas exploration, development and production is influenced by a variety of factors, including the prevailing prices for crude oil and natural gas, which often fluctuate widely in response to global supply and demand, international economic trends, currency exchange fluctuations and political events. Demand for our Water Midstream services is highly dependent on the level of exploration, development and production of crude oil and natural gas in the geographic areas in which we operate. Because our operations are impacted by certain seasonality, our results can fluctuate significantly, which could make it difficult to evaluate our business and could cause instability in the market price of our common stock. Adverse weather conditions, natural disasters, disease, force majeure and other similar events can curtail our operations in various regions in which we operate, resulting in performance delays and increased costs. Moreover, our domestic activities and related revenue and earnings tend to decrease in the winter months when adverse weather conditions interfere with access to drilling or other infrastructure services sites. Additionally, activities related to our domestic and international operations can decrease due to year end holidays as certain customers stop operations during this time. As a result, our revenue and earnings in the second and third quarters tend to be higher than revenue and earnings in the first and fourth quarters. Accordingly, as a result of the foregoing as well as other factors, our quarterly results should not be considered indicative of results to be expected for any other quarter or for any full fiscal year. Our failure to meet the schedule or performance requirements of our contracts could harm our reputation, reduce our client base and harm our future operations. In certain circumstances, we guarantee contract completion by a scheduled acceptance date. Failure to meet any such schedule could result in additional costs and the amount of such additional costs could exceed projected profit margins. These additional costs could include liquidated damages paid under contractual penalty provisions, which can be substantial and can accrue on a daily basis. In addition, our actual costs could exceed our projections. Performance problems for existing and future contracts could increase the anticipated costs of performing those contracts and cause us to suffer damage to our reputation within our industry and our client base, which would harm our future business. The timing of new contract awards and the performance of those new contracts could result in fluctuations in our operating results and cash flows. New projects often entail a lengthy and complex design and bidding process. This process can be affected by governmental approvals, budget negotiations, funding approvals, permitting, weather, as well as changing market conditions. The uncertainty of the timing of contract awards as well as the timing of the commencement date of the contract can have an adverse effect on our results of operations and cash flows causing fluctuations from quarter to quarter or year to year. These fluctuations can be significant. We may not fully realize the anticipated benefits from our restructuring plans. We continue to implement certain restructuring initiatives that seek to reduce our cost structure and streamline our operations. These restructuring plans have, among other things, resulted in a reduction in workforce, cost containment measures and working capital management initiatives. Our restructuring plans may not reduce expenses or produce the cost savings we anticipate or in the time frame we expect. Further restructuring activities may also be required in the future beyond what is currently planned, which could enhance the risks associated with these activities. In addition, our management periodically reviews our businesses and portfolio of assets to identify those businesses and assets that may be underperforming and for which we may consider a sale or other disposition. However, we may not correctly identify businesses or assets that are, or will be, underperforming, and we may not be able to dispose of those businesses and assets on favorable terms in a timely manner, if at all. Our inability to identify and favorably dispose of underperforming businesses and assets may significantly harm our business. If we are unable to retain skilled workers, or if a work stoppage occurs as a result of disputes relating to collective bargaining agreements, our ability to operate our business could be limited and our revenue could be reduced. Our ability to remain productive, profitable and competitive depends substantially on our ability to retain and attract skilled workers with expert geological and other engineering knowledge and capabilities. The demand for these workers is high and the supply is limited. An inability to attract and retain trained drillers and other skilled employees could limit our ability to operate our business and reduce our revenue. As of January 31, 2018, approximately 3% of our workforce was unionized and 3 of our 8 active collective bargaining agreements are scheduled to expire within the next 12 months. To the extent that disputes relating to existing or future collective bargaining agreements arise, a work stoppage could occur. If protracted, a work stoppage could reduce or suspend our operations and reduce our revenue. Fluctuations in the prices of raw materials could increase our operating costs. We purchase steel, resin, concrete and fuel for use in connection with our businesses. We also purchase a significant volume of fuel to operate our trucks and equipment. The manufacture of materials used in our sewer rehabilitation business is dependent upon the availability of resin, a petroleum-based product. At present, we do not engage in any type of hedging activities to mitigate the risks of fluctuating market prices for oil, steel, resin, concrete or fuel and increases in the price of these materials may increase our operating costs. International trade tariffs and restrictions in the steel market may adversely affect our business. Portions of our business either use significant quantities of imported steel or are dependent on providing products and services to customers that import steel into the United States from the international markets. To the extent that trade tariffs and other restrictions imposed by the United States increase the price of, or limit the amount of, steel imported into the United States, the costs of our raw materials may be adversely affected and/or the demand from our customers for products and services may be diminished, which could adversely affect our revenues and profitability. If we are not able to demonstrate our technical competence, competitive pricing and reliable performance to potential customers we will lose business to competitors, which would reduce our profit. We face significant competition and a large part of our business is dependent upon obtaining work through a competitive bidding process. In Water Resources and Inliner, we compete with many smaller firms on a local or regional level, many of whom may have a lower corporate overhead cost than us. We also compete with larger competitors that may be better capitalized than us and may have a lower cost of capital. There are few proprietary technologies or other significant factors which prevent other firms from entering these local or regional markets or from consolidating together into larger companies more comparable in size to our company. Competition also places downward pressure on our contract prices and profit margins. Competition in all of our markets has intensified in the last few years and such heightened competition may continue for the foreseeable future. If we are unable to meet these competitive challenges, we could lose market share to our competitors and experience an overall reduction in our profit. Additional competition could reduce our profit. If we cannot obtain third-party subcontractors, or if their performance is unsatisfactory, our profit could be reduced. We rely on third-party subcontractors to provide services on some of our projects. To the extent that we cannot engage subcontractors as planned, our ability to complete a project in a timely fashion or at a profit may be impaired. If the amount we are required to pay for subcontracted services exceeds the amount we have estimated in bidding for fixed-price work, we could experience reduced profits or losses in the performance of these contracts. In addition, if a subcontractor is unable to deliver its services according to the negotiated terms for any reason, including the deterioration of its financial condition, we may be required to purchase the services from another source at a higher price, which could reduce the profit to be realized or result in a loss on a project for which the services were needed. Also, if our subcontractors perform unsatisfactory work, we may become subject to increased warranty costs or product liability or other claims against us. We may pay our suppliers and subcontractors before receiving payment from our customers for the related services. We use suppliers to obtain the necessary materials and subcontractors to perform portions of our services and to manage work flow. In some cases, we pay our suppliers and subcontractors before our customers pay us for the related services. We may pay our suppliers and subcontractors for materials purchased and work performed for customers who fail to pay, or delay paying, us for the related work, which could harm our liquidity and results of operations. We extend trade credit to customers for purchases of our services and in the past we have had and in the future we may have, difficulty collecting receivables from customers that experience financial difficulties. We grant trade credit, generally without collateral, to our customers, which include mining companies, general contractors, commercial and industrial facility owners, government agencies and industrial companies. Consequently, we are subject to potential credit risk related to changes in business and economic factors in the geographic areas in which our customers are located. If any of our major customers experience financial difficulties, we could experience reduced cash flows and losses in excess of current allowances provided. In addition, material changes in any of our customers’ revenues or cash flows could affect our ability to collect amounts due from them. If we are unable to obtain performance bonds or letters of credit on acceptable terms, our ability to obtain future projects could be negatively impacted. A portion of our projects require us to procure a bond to secure performance. Our continued ability to obtain surety bonds primarily will depend upon our capitalization, working capital, past performance, management expertise and reputation and certain external factors, including the overall capacity of the surety market. Surety companies consider such factors in relationship to the amount of our backlog and their underwriting standards, which may change from time to time. With a decreasing number of insurance providers in that market, it may be difficult to find sureties who will continue to provide contract-required bonding on acceptable terms and conditions. We have granted our sureties a security interest in certain assets. The surety companies may in the future request us to provide further collateral or other security. Our ability to satisfy any future requests may require the consent of the lenders under the asset-based credit facility. If the lenders are unwilling to agree to any future requests on terms acceptable to the surety companies, we may be unable to continue to obtain performance bonds on acceptable terms. On certain projects we may enter into a joint venture agreement with others. Our ability to obtain a bond may also depend on the credit and performance risks of our joint venture partners. In addition, events that generally affect the insurance and bonding markets may result in bonding becoming more difficult to obtain in the future, being available only at a significantly greater cost or not being available at all. If we are unable to obtain performance bonds on future projects, our results of operations would be materially and adversely affected. The amount of our surety bonds as of January 31, 2018, based on the expected amount of revenues remaining to be recognized on the projects, was $148.3 million; $48.4 million relates to surety bonds on contracts which were assumed by the purchaser of our former Heavy Civil business which we do not expect to be released until the jobs are completed. We also occasionally utilize a letter of credit instead of a performance bond. Almost all of the letters of credit are issued under the asset-based credit facility. Our ability to continue to obtain new letters of credit under the asset-based credit facility is limited to the lesser of (a) $75.0 million and (b) the amount of Excess Availability (as defined in the asset-based credit facility agreement) under the asset-based credit facility and is subject to limitations on the issuance of letters of credit if the expiry date of the proposed letter of credit extends beyond the five business days prior to the maturity date of the asset-based credit facility. Our inability to obtain bonding or letters of credit on favorable terms and at reasonable prices or at all would increase operating costs and inhibit the ability to execute or pursue new projects, which could have a material adverse effect on our business, financial condition and results of operations. We may experience cost overruns on our fixed-price contracts, which could reduce our profitability and we may suffer additional losses. A significant number of our contracts contain fixed prices and generally assign responsibility for cost overruns to us. Under such contracts, prices are established in part on cost and scheduling estimates, which are based on a number of assumptions, many of which are beyond our control. These assumptions include job-site conditions (both surface and sub-surface), future economic conditions, prices and availability of materials, labor and other requirements. Estimates are revised based upon changing conditions and new developments that are continuous and characteristic of the drilling and infrastructure services. In addition, the time required to complete a drilling or infrastructure project may be greater than originally anticipated. We may not be able to obtain compensation for additional work performed or expenses incurred as a result of changes or inaccuracies in these estimates and underlying assumptions. We have experienced inaccurate estimates, or changes in other circumstances, such as unanticipated technical problems, difficulties obtaining permits or approvals, changes in local laws or labor conditions, ambiguities in specifications, supply shortages, weather delays, unanticipated sub-surface site conditions, accidents, equipment failures, inefficiencies, cost of raw materials, or our suppliers’ or subcontractors’ inability to perform, which could result in substantial losses. As a result, cost and gross margin may vary from those originally estimated making the project less profitable than originally estimated, or possibly not profitable at all and, depending upon the size of the project, variations from estimated contract performance could significantly affect our operating results. Our use of the percentage of completion method of accounting involves significant estimates and management judgment, changes of which could result in volatility in our results of operations. change orders, which are a normal and recurring part of our business and can increase or decrease the scope of work and therefore the revenue and the cost of a job. The above items can change the estimates on a contract, including those arising from contract penalty provisions and final contract settlements and can result in revisions to costs and income. Revisions in estimates are recognized in the period in which they are determined. This could result in the reduction or reversal of previously recorded revenues and profits. Change orders often change the scope and cost of a contract. Change orders can also have the short-term effect of reducing the percentage of completion on a contract and the revenues and profits that otherwise would be recognized. We also factor in all other information that we possess with respect to the change order to determine whether the change order should be recognized at all and, if recognition is appropriate, what dollar amount of the change order should be recognized. Due to factors that we may not anticipate at the time of recognition, however, revenues ultimately received on these change orders could be less than revenues that we recognized in a prior reporting period or periods, which could require us in subsequent reporting periods to reduce revenues and profit previously recognized. Our contracts may require us to perform extra, or change order work, which can result in disputes or claims and adversely affect our working capital, profits and cash flows. Our contracts generally require us to perform extra, or change order, work as directed by the customer even if the customer has not agreed in advance on the scope or price of the work to be performed. This process may result in disputes or claims over whether the work performed is beyond the scope of work directed by the customer and/or exceeds the price the customer is willing to pay for the work performed. To the extent we do not recover our costs for this work or there are delays in the recovery of these costs, our cash flows and working capital could be adversely impacted. As of January 31, 2018, our backlog of uncompleted drilling and infrastructure services was approximately $178.6 million. The revenue projected in our backlog may not be realized or, if realized, may not result in profits. Projects reflected in our contract backlog may be affected by project cancellations, scope adjustments, time extensions or other changes. Such changes may adversely affect the revenue and profit we ultimately realize on these projects. Our actual results could differ if the estimates and assumptions that we use to prepare our financial statements are inaccurate. assumptions for litigation, claims and other reserves. If these estimates or assumptions are inaccurate, our actual results could differ materially from currently recorded amounts. If we do not attract and retain qualified managers and executives, our business could be materially and adversely affected. We are very dependent on the skills and motivation of our employees, managers and executives to define and implement our corporate strategies and operational plans. We maintain and rely on a small executive team to manage our business. We may not be successful in retaining or attracting qualified replacements should any personnel leave. The loss of members of our executive team and inability to retain and attract suitable replacements could materially and adversely affect our business. Because we are a multinational company conducting a complex business in several markets in North America and South America, we are subject to legal and operational risks related to staffing and management, as well as a broad array of local legal and regulatory requirements. Operating outside of the U.S. creates difficulties associated with staffing and managing our international operations, as well as complying with local legal and regulatory requirements. The laws and regulations in the markets in which we operate are subject to rapid change. Although we have local staff in countries in which we deem it appropriate, we cannot ensure that we will be operating in full compliance with all applicable laws or regulations to which we may be subject, including customs and clearing, tax, immigration, employment, worker health and safety and environmental. We also cannot ensure that these laws will not be modified in ways that may adversely affect our business. A portion of our earnings is generated from our foreign operations and those of our affiliates. Political and economic risks in those countries could reduce or eliminate the earnings and cash flow due to dividends we derive from those operations. exchange controls and limitations on remittance of dividends or other payments to us by our foreign subsidiaries and affiliates. In particular, changes in laws or regulations or in the interpretation of existing laws or regulations, whether caused by a change in government or otherwise, could materially adversely affect our business, growth, financial condition or results of operations. For example, while there are currently no limitations on the repatriation of profits from the countries in which we have subsidiaries, several countries do impose withholding taxes on dividends or fund transfers. Foreign funds transfer restrictions, taxes or limitations may be imposed or increased in the future with regard to repatriation of earnings and investments from countries in which we operate. If foreign funds transfer restrictions, taxes or limitations are imposed, our ability to receive dividends or other payments from affected subsidiaries could be reduced, resulting in an adverse material effect. In addition, corporate, contract, property, insolvency, competition, securities and other laws and regulations in Mexico and South America have been and continue to be, substantially revised. Therefore, the interpretation and procedural safeguards of the new legal and regulatory systems are in the process of being developed and defined and existing laws and regulations may be applied inconsistently. Also, in some circumstances, it may not be possible to obtain the legal remedies provided for under these laws and regulations in a reasonably timely manner, if at all. We perform work at mining operations in countries which have experienced political and economic instability in the past, or may experience similar instability in the future. The mining industry is subject to regulation by the countries in which we have operations relating to matters such as environmental protection, controls and restrictions on production and, potentially, nationalization, expropriation or cancellation of contract rights, as well as restrictions on conducting business in such countries. In addition, in our foreign operations we face operating difficulties, including political instability, workforce instability, harsh environmental conditions and remote locations. We do not maintain political risk insurance. Adverse events beyond our control in the areas of our foreign operations could reduce the earnings derived from our foreign operations to the extent that contractual provisions and bilateral agreements between countries may not be sufficient to guard our interests. Our operations in foreign countries expose us to devaluations and fluctuations in currency exchange rates. We operate a portion of our business in countries outside the U.S. The majority of our costs in those locations are transacted in local currencies. Although we generally contract with our customers in U.S. dollars, some of our contracts are in other currencies. We do not currently engage in foreign currency hedging transactions. As exchange rates among the U.S. dollar and other currencies fluctuate, the translation effect of these fluctuations may have a material adverse effect on our results of operations or financial condition as reported in U.S. dollars. Exchange rate policies have not always allowed for the free conversion of currencies at the market rate. Future fluctuations in the value of the U.S. dollar could have an adverse effect on our results. In addition, some of the countries in which we operate have foreign currency restrictions that may prohibit or limit our ability to convert local currencies into U.S. dollars and/or transfer U.S. dollars from such countries to the U.S., which restrictions could affect our liquidity or our ability to use such funds in other countries. We conduct business in international markets with complex and evolving tax rules, including value-added tax rules, which subject us to international tax compliance risks. While we obtain advice from legal and tax advisors as necessary to help assure compliance with tax and regulatory matters, most tax jurisdictions that we operate in have complex and subjective rules regarding the valuation of intercompany services, cross-border payments between affiliated companies and the related effects on income tax, value-added tax (“VAT”), transfer tax and share registration tax. Our foreign subsidiaries frequently undergo VAT reviews and from time to time undergo comprehensive tax reviews and may be required to make additional tax payments should the review result in different interpretations, allocations or valuations of our products or services. Certain countries may, from time to time, make changes to their existing tax structure which might affect our operations. These countries may, with little or no notice, implement additional taxes in the form of severance taxes, windfall profits taxes, production taxes and tariffs, which could negatively impact our results in our segments that perform services in those countries. We earn a portion of our operating income from outside of the U.S. and any repatriation of funds currently held in foreign jurisdictions may result in additional tax expense. Uncertainties in the interpretation and application of the Tax Cuts and Jobs Act of 2017 could materially affect our tax disclosures and our effective tax rate in the future when we return to profitability. The Tax Cuts and Jobs Act of 2017 ("The Act") was enacted on December 22, 2017, and it significantly affected U.S. tax law by, among other things, changing how the U.S. imposes income tax on multinational corporations. The Act contains several key tax provisions that affect us, including a one-time mandatory transition tax on accumulated foreign earnings and a reduction of the corporate income tax rate to 21% effective January 1, 2018, among others. We are required to recognize the effect of the tax law changes in the period of enactment, including determining the transition tax, re-measuring our U.S. deferred tax assets and liabilities and reassessing the net realizability of our deferred tax assets and liabilities. Staff Accounting Bulletin No. 118, Income Tax Accounting Implications of the Tax Cuts and Jobs Act (“SAB 118”) allows us to record provisional amounts during a measurement period not to extend beyond one year of the enactment date. We have recorded provisional estimates in our financial statements with respect to certain income tax effects of The Act for which the accounting is incomplete, but a reasonable estimate was able to be determined. We will continue to perform additional analysis on the application of The Act, taking into account any additional regulatory guidance that is issued by the applicable taxing authorities, which may result in adjustments to our previously reported provisional estimates. In accordance with the SEC's guidance, we will recognize any adjustments to our previously reported provisional estimates in the relevant future periods, which could materially affect our tax obligations and our effective tax rate. See Note 10 to the Consolidated Financial Statements. In addition, The Act requires complex computations not previously provided in U.S. tax law, and the application of accounting guidance for such items is currently uncertain in some respects. Further, compliance with The Act and the accounting for such provisions require accumulation of information not previously required or regularly produced. The U.S. Department of Treasury has broad authority to issue regulations and interpretative guidance that may significantly impact how the law is applied and thus impact our results of operations in the period issued. Professional liability, product liability, warranty and other claims against us could reduce our revenue. Any accidents, design defect or system failures in excess of insurance limits at locations that we engineer or construct or where our products are installed or where we perform services could result in significant professional liability, product liability, warranty and other claims against us. Further, the drilling and infrastructure services projects we perform expose us to additional risks, including cost overruns, equipment failures, personal injuries, property damage, shortages of materials and labor, work stoppages, labor disputes, weather problems and unforeseen engineering, architectural, environmental and geological problems. In addition, once our drilling and infrastructure services are complete, we may face claims with respect to the work performed. If we incur these claims, we could incur substantial losses of revenue or additional costs. See Note 15, “Contingencies” to our Consolidated Financial Statements for a further discussion. Our business is subject to numerous operating hazards, logistical limitations and force majeure events that could significantly reduce our liquidity, suspend our operations and reduce our revenue and future business. Our drilling and infrastructure services activities involve operating hazards that can result in personal injury or loss of life, damage or destruction of property and equipment, damage to the surrounding areas, release of hazardous substances or wastes and other harm to the environment. To the extent that the insurance protection we maintain is insufficient or ineffective against claims resulting from the operating hazards to which our business is subject, our liquidity could be significantly reduced. In addition, our operations are subject to delays in obtaining equipment and supplies and the availability of transportation for the purpose of mobilizing rigs and other equipment, particularly where rigs or mines are located in remote areas with limited infrastructure support. Our business operations are also subject to force majeure events such as adverse weather conditions, natural disasters and mine accidents or closings. If our drill site or infrastructure services operations were interrupted or suspended as a result of any such events, we could incur substantial losses of revenue and future business. Our failure to comply with the regulations of the U.S. Occupational Safety and Health Administration, the U.S. Mine Safety and Health Administration, the U.S. Department of Transportation and other state and local agencies that oversee transportation and safety compliance could reduce our revenue, profitability and liquidity. OSHA, MSHA and other comparable state and foreign laws establish certain employer responsibilities, including maintenance of a workplace free of recognized hazards likely to cause death or serious injury, compliance with standards promulgated by the applicable regulatory authorities and various recordkeeping, disclosure and procedural requirements. Various standards, including standards for notices of hazards and safety in excavation and demolition work may apply to our operations. We have incurred and will continue to incur, capital and operating expenditures and other costs in the ordinary course of business in complying with OSHA, MSHA and other state, local and foreign laws and regulations and could incur penalties and fines in the future, including in extreme cases, criminal sanctions. While we have invested, and will continue to invest, substantial resources in worker health and safety programs, the industries in which we operate involve a high degree of operational risk and there can be no assurance that we will avoid significant liability exposure. Although we have taken what are believed to be appropriate precautions, we have suffered employee injuries and fatalities in the past and may suffer additional injuries or fatalities in the future. Serious accidents of this nature may subject us to substantial penalties, civil litigation or criminal prosecution. Personal injury claims for damages, including for bodily injury or loss of life, could result in substantial costs and liabilities, which could materially and adversely affect our financial condition, results of operations or cash flows. In addition, if our safety record were to substantially deteriorate, or if we suffered substantial penalties or criminal prosecution for violation of health and safety regulations, customers could cancel existing contracts and not award future business to us, which could materially adversely affect our liquidity, cash flows and results of operations. We have, from time to time, received notice from the DOT that our motor carrier operations may be monitored and that the failure to improve our safety performance could result in suspension or revocation of vehicle registration privileges. If we were not able to successfully resolve these issues, our ability to service our customers could be damaged, which could lead to a material adverse effect on our results of operations, cash flows and liquidity. The cost of complying with complex governmental regulations applicable to our business, sanctions resulting from non-compliance or reduced demand resulting from increased regulations could increase our operating costs and reduce our profit. Our drilling and infrastructure services are subject to various licensing, permitting, approval and reporting requirements imposed by federal, state, local and foreign laws. Our operations are subject to inspection and regulation by various governmental agencies, including the DOT, OSHA and MSHA of the Department of Labor in the U.S., as well as their counterparts in foreign countries. A major risk inherent in drilling and infrastructure services is the need to obtain permits from local authorities. Delays in obtaining permits, the failure to obtain a permit for a project or a permit with unreasonable conditions or costs could limit our ability to effectively provide our services. In addition, these regulations also affect our mining customers and may influence their determination to conduct mineral exploration and development. Future changes in these laws and regulations, domestically or in foreign countries, could cause our customers to incur additional expenses or result in significant restrictions to their operations and possible expansion plans, which could reduce our profit. Our water treatment business is impacted by legislation and municipal requirements that set forth discharge parameters, constrain water source availability and set quality and treatment standards. The success of our groundwater treatment services depends on our ability to comply with the stringent standards set forth by the regulations governing the industry and our ability to provide adequate design and infrastructure services solutions cost-effectively. In most states, one of our employees is required to be a licensed contractor in order for us to bid for, or perform, certain types of infrastructure services related projects. From time to time, we are temporarily unable to bid for, or perform work with respect to, those types of infrastructure services projects in a particular state, because our licensed employee resigns, is terminated, or dies. Depending upon the length of time to qualify another employee as a licensed contractor in the state and the number and size of the affected projects in that state, the loss of the services of an employee that is a licensed contractor could have a material adverse effect on our results of operations. The SEC rules require disclosure of the use of tin, tantalum, tungsten and gold, known as conflict minerals, in products manufactured by public companies. The SEC rules require that public companies conduct due diligence to determine whether such minerals originated from the Democratic Republic of Congo (DRC) or an adjoining country. We have incurred additional costs associated with complying with these disclosure requirements, including costs to determine the origin of conflict minerals used in our products. In addition, the implementation of these rules could adversely affect the sourcing, supply and pricing of materials used in our products. Also, we may face reputational challenges if the due diligence procedures we implement do not enable us to verify the origins for all conflict minerals. We may also encounter challenges to satisfy customers that may require all of the components of products purchased to be certified as DRC conflict-free because our supply chain is complex. If we are not able to meet customer requirements, customers may choose to disqualify us as a supplier. Our activities are subject to environmental regulation that could increase our operating costs or suspend our ability to operate our business. We are required to comply with foreign, federal, state and local laws and regulations regarding health and safety and the protection of the environment, including those governing the generation, storage, use, handling, transportation, discharge, disposal and clean-up of hazardous substances in the ordinary course of our operations. We are also required to obtain and comply with various permits under current environmental laws and regulations and new laws and regulations, or changed interpretations of existing requirements, which may require us to obtain and comply with additional permits and/or subject us to enforcement or penalty proceedings. We may be unable to obtain or comply with, and could be subject to revocation of, permits necessary to conduct our business. The costs of complying with environmental laws, regulations and permits may be substantial and any failure to comply could result in fines, penalties or other sanctions. Our operations are sometimes conducted in or near ecologically sensitive areas, such as wetlands, which are subject to special protective measures and which may expose us to additional operating costs and liabilities related to restricted operations, for unpermitted or accidental discharges of oil, natural gas, drilling fluids, contaminated water or other substances or for noncompliance with other aspects of applicable laws and regulations. Our operations are subject to various environmental laws and regulations, including those dealing with the handling and disposal of waste products, PCBs, fuel storage and air quality. Certain of our current and historical operations have used hazardous materials and, to the extent that such materials are not properly stored, contained, recycled or disposed of, they could become hazardous waste. new laws and regulations require water to be disposed in a different manner. The cost to dispose of, or treat that water or otherwise comply with these regulations concerning water disposal may reduce our profitability. Various foreign, federal, state and local environmental laws and regulations may impose liability on us with respect to conditions at our current or former facilities, sites at which we conduct or have conducted operations or activities or any third-party waste disposal site to which we send hazardous wastes. We may be subject to claims under various environmental laws and regulations, federal and state statutes and/or common law doctrines for toxic torts and other damages, as well as for natural resource damages and the investigation and clean-up of soil, surface water, groundwater and other media under laws such as CERCLA. Such claims may arise, for example, out of current or former conditions at project sites, current or former properties owned or leased by us and contaminated sites that have always been owned or operated by third parties. Liability may be imposed without regard to fault and may be strict, joint and several, such that we may be held responsible for more than our share of any contamination or other damages, or even for the entire share, and may be unable to obtain reimbursement from the parties causing the contamination. The costs of investigation or remediation at these sites may be substantial. Environmental laws are complex, change frequently and have tended to become more stringent over time. Compliance with, and liability under, current and future environmental laws, as well as more vigorous enforcement policies or discovery of previously unknown conditions requiring remediation, could increase our operating costs and reduce our revenue. See Part I, Item 1—Business—Regulation in this Form 10-K for additional information. If our health insurance, liability insurance or workers’ compensation insurance is insufficient to cover losses resulting from claims or hazards, if we are unable to cover our deductible obligations or if we are unable to obtain insurance at reasonable rates, our operating costs could increase and our profit could decline. Although we maintain insurance protection that we consider economically prudent for major losses, we have high deductible amounts for each claim under our health insurance, workers’ compensation insurance and liability insurance. Our current individual claim deductible amount is $200,000 for health insurance, and on a per occurrence basis it is $750,000 for auto liability insurance and $500,000 for workers’ compensation insurance. Our general liability insurance is subject to a per claim self-insured retention of $750,000. We cannot assure that we will have adequate funds to cover our deductible obligations or that our insurance will be sufficient or effective under all circumstances or against all claims or hazards to which we may be subject or that we will be able to continue to obtain such insurance protection. In addition, we may not be able to maintain insurance of the types or at levels we deem necessary or adequate or at rates we consider reasonable. A claim or damage resulting from a hazard for which we are not fully insured could increase our operating costs and reduce our profit. The cost of defending litigation or successful claims against us could reduce our profit or significantly limit our liquidity and impair our operations. We have been and from time to time may be named as a defendant in legal actions claiming damages in connection with drilling or other infrastructure services projects and other matters. These are typically actions that arise in the normal course of business, including employment-related claims and contractual disputes or claims for personal injury or property damage that occur in connection with drilling or infrastructure site services. To the extent that the cost of defending litigation or successful claims against us is not covered by insurance, our profit could decline, our liquidity could be significantly reduced and our operations could be impaired. Geoconstruction, one of our discontinued segments, was a subcontractor on the foundation for the Salesforce Tower office building in San Francisco, California in 2013 and 2014. Certain anomalies were discovered in March 2014 in the foundation’s structural concrete, which were remediated by the general contractor during 2015. We have participated in discussions with the project owner and the general contractor regarding potential causes of the anomalies. We have assigned our claims under the project's builder's risk insurance policy to the general contractor. During the fiscal year ended January 31, 2016, the owner and the general contractor submitted a claim to the project’s builder’s risk insurers to cover the cost of remedial work and related damages. The claim was denied by the builder’s risk insurers and the owner and the general contractor subsequently filed a legal proceeding against the insurers seeking coverage under the builder’s risk insurance policy. Although we are not a party to this legal proceeding, management believes, based on court filings in the legal proceeding, that the owner and the general contractor are asserting a claim for damages against the project’s builder’s risk insurers of approximately $100 million. Accordingly, no provision has been made in these Consolidated Financial Statements. See Note 15 to our Consolidated Financial Statements for a further discussion of this contingency. Our ability to use U.S. federal net operating loss carryforwards, foreign tax credit carryforwards, capital loss carryforwards and net unrealized built-in losses could be severely limited in the event of certain share transfers of our common stock. We currently have a significant U.S. deferred tax asset, before considering valuation allowances, which results from federal net operating loss carryforwards, foreign tax credit carryforwards, capital loss carryforwards and net unrealized built-in losses. While we have recorded a full valuation allowance against the net deferred tax asset, the carryforwards and the future use of these attributes could provide significant future tax savings to us if we are able to use such losses and credits. However, our ability to use these tax benefits may be restricted due to a future ownership change within the meaning of Section 382 of the Internal Revenue Code. An ownership change could occur that would severely limit our ability to use the tax benefits associated with the net operating loss carryforwards, foreign tax credit carryforwards, capital loss carryforwards and net unrealized built-in losses, which may result in a significantly higher tax cost compared to the situation where these tax benefits are preserved. If we are unable to protect our intellectual property adequately, the value of our patents and trademarks and our ability to operate our business could be harmed. We rely on a combination of patents, trademarks, trade secrets and similar intellectual property rights to protect the proprietary technology and other intellectual property that are instrumental to our operations. We may not be able to protect our intellectual property adequately and our use of this intellectual property could result in liability for patent or trademark infringement or unfair competition. Further, through acquisitions of third parties, we may acquire intellectual property that is subject to the same risks as the intellectual property we currently own. We may be required to institute litigation to enforce our patents, trademarks or other intellectual property rights, or to protect our trade secrets from time to time. Such litigation could result in substantial costs and diversion of resources and could reduce our profit or disrupt our business, regardless of whether we are able to successfully enforce our rights. We may be exposed to liabilities under the Foreign Corrupt Practices Act and any determination that Layne or any of its subsidiaries has violated the Foreign Corrupt Practices Act could have a material adverse effect on our business. We operate in some countries known to experience corruption. We are committed to doing business in accordance with applicable anti-corruption laws and our code of business conduct and ethics. We are subject, however, to the risk that we, our affiliated entities or their respective officers, directors, employees and agents may take action determined to be in violation of such anti-corruption laws, including the FCPA. The FCPA and related statutes and regulations provide for potential fines, civil and criminal penalties and equitable remedies, including disgorgement of profits or monetary benefits from such payments, related interest and injunctive relief. These fines and penalties can be significant. Further, detecting, investigating and resolving these types of matters is expensive and could consume significant time and attention of our senior management. We could also face fines, sanctions and other penalties from authorities in the relevant foreign jurisdictions, including prohibition of our participating in or curtailment of business operations in those jurisdictions and the seizure of rigs or other assets. Our customers in those jurisdictions could seek to impose penalties or take other actions adverse to our interest. We could also face other third-party claims by our directors, officers, employees, affiliates, advisors, attorneys, agents, stockholders, debt holders or other interest holders or constituents. In addition, disclosure of the subject matter of the investigation could adversely affect our reputation and our ability to obtain new business or retain existing business from our current clients and potential clients, to attract and retain employees and to access the capital markets. Future violations of the FCPA may also give rise to an event of default under the agreements governing our debt instruments if such violation were to have a material adverse effect on our business, assets, property, financial condition or prospects or if the amount of any settlement resulted in our failing to satisfy any financial covenants. Future climate change could adversely affect us. The prospective impact of potential climate change on our operations and those of our customers remains uncertain. Some scientists have hypothesized that the impacts of climate change could include changes in rainfall patterns, water shortages, snowpack levels, changing sea levels, changing storm patterns and intensities and changing temperature levels and that these changes could be severe. These impacts could vary by geographic location. At the present time, we cannot predict the prospective impact of potential climate change on our results of operations, liquidity or capital resources, or whether any such effects could be material to us. Deliberate, malicious acts, including terrorism and sabotage, could damage our facilities, disrupt our operations or injure employees, contractors, customers or the public and result in liability to us. Intentional acts of destruction could hinder our sales or production and disrupt our supply chain. Our facilities could be damaged or destroyed, reducing our operational production capacity and requiring us to repair or replace our facilities at substantial cost. Employees, contractors and the public could suffer substantial physical injury for which we could be liable. Governmental authorities may impose security or other requirements that could make our operations more difficult or costly. The consequences of any such actions could adversely affect our operating results and financial condition. We are dependent on our information systems. Information technology systems are an integral part of the efficient functioning of our business as well as the security of our information. Problems with the implementation of new or upgraded systems as our business grows or with maintenance or discontinuance of existing systems could disrupt or reduce the efficiency of our operations. In the ordinary course of our business, we collect and store sensitive data, including intellectual property, our proprietary business information and that of our customers and suppliers and personally identifiable information of our employees, in our facilities and on our networks. The secure processing, maintenance and transmission of this information is critical to our operations. Despite our security measures, our information technology and infrastructure may be vulnerable to attacks by hackers or breached due to employee error, malfeasance or other disruptions. Any such breach could compromise our networks and the information stored there could be accessed, publicly disclosed, lost or stolen. Any such access, disclosure or other loss of information could result in legal claims or proceedings, disrupt our operations, damage our reputation and cause a loss of confidence, which could adversely affect our business. Claims for indemnification related to the sale of business units and assets may be substantial and have a negative impact on our financial condition. From time to time, we dispose of business units or assets, including the recent dispositions of our Heavy Civil and Geoconstruction businesses. As part of a sale, we have agreed and may in the future agree to indemnify the purchaser for certain pre-closing liabilities associated with the business unit or assets that are sold and for any breach of the representations and warranties contained in the asset purchase agreement for the transaction. There can be no guarantee that material claims will not arise during the relevant indemnification periods and that we will not have to provide the requisite indemnification. In addition, legal challenges to any potential claim for indemnification could result in increased legal expenses. Also, as is typical in divestiture transactions, some third parties have been, and in the future may be, unwilling to release us from guarantees, performance bonds or other credit support provided prior to the sale of the business unit or assets. As a result, after a divestiture, we may remain secondarily liable for some of the obligations guaranteed, bonded or supported to the extent that the buyer of the business unit or assets fails to perform these obligations. Our substantial indebtedness could adversely affect our financial health and prevent us from fulfilling our obligations. limit our ability to borrow additional funds if needed. In addition, the agreements governing our indebtedness and any future indebtedness we incur may contain restrictive covenants that will limit our ability to engage in activities that may be in our long-term best interests. Our failure to comply with those covenants could result in an event of default that, if not cured or waived, could result in the acceleration of all of our debt. Our growth plans and our ability to make payments of principal or interest on, or to refinance our indebtedness will depend on our future operational performance and our ability to enter into additional debt or equity financings. If we are unable to generate sufficient cash flows in the future to service our debt, we may be required to refinance all or a portion of our existing debt, to sell assets or to obtain additional financing, which we may be unable to do on favorable terms, if at all. Servicing our debt requires a significant amount of cash and we may not have sufficient cash flow from our business to service our substantial debt. Our ability to make scheduled payments of the principal of, to pay interest on, or to refinance our indebtedness depends on our future performance which is subject to economic, financial, competitive and other factors beyond our control. Our business may not generate cash flow from operations in the future sufficient to service our debt because of factors beyond our control. If we are unable to generate such cash flow, we may be required to adopt one or more alternatives such as selling assets, restructuring debt or obtaining additional equity capital on terms that may be onerous or highly dilutive. Our ability to refinance our indebtedness will depend on the capital markets and our financial conditions at such time. We may not be able to engage in any of these activities or engage in these activities on desirable terms which could result in a default on our debt obligations. We may not have sufficient borrowing capacity under our asset-based credit facility to meet our liquidity requirements and a reduction in our borrowing base could result in a portion of our borrowings becoming immediately due. We may need to borrow on our asset-based credit facility in the future for our liquidity needs. If we are unable to borrow under our asset-based credit facility or otherwise obtain capital as needed to operate our business, our financial performance and position could materially suffer. Our ability to borrow under our asset-based credit facility depends on, among other things, the amount of the borrowing base as defined in the asset-based credit facility and our available capacity under the asset-based credit facility. Continued operating losses or negative cash flows from our operations may cause Layne to borrow under our asset-based credit facility and reduce the available capacity under the asset-based credit facility. Our borrowing base is primarily comprised of a percentage of the net orderly liquidation value of eligible equipment and the value of certain customer and contract receivables. Our borrowing base is reduced by any reserves that the co-collateral agents under our asset-based credit facility determine to be necessary in good faith and their reasonable business judgment. As of January 31, 2018, total availability under the asset-based credit facility was $100.0 million, with $24.6 million of letters of credit and no borrowings outstanding, resulting in Excess Availability of $75.4 million. The amount of our borrowing base could be materially and adversely affected by decreases in the value of our eligible equipment and/or receivables, a portion of our equipment and/or receivables being deemed ineligible under the terms of our asset-based credit facility or the co-collateral agents imposing additional reserve requirements. In addition, if our borrowing base is reduced below the amount of letters of credit and borrowings outstanding under our asset-based credit facility, then the excess indebtedness would, absent a waiver or amendment, become immediately due and payable and any outstanding letters of credit could require replacement or cash collateralization. We may not have the resources to make any required repayment or cash collateralization and such repayment obligation or cash collateralization could have a material adverse impact on our liquidity and financial condition. We may not have sufficient capital resources to repay all of our indebtedness as it matures. $99.9 million of 8.0% Convertible Notes that are due on May 1, 2019. However, if the 4.25% Convertible Notes have not been redeemed, repurchased, otherwise retired, discharged in accordance with their terms or converted into our common stock, or effectively discharged, in each case on or prior to August 15, 2018 or the scheduled maturity date of the 4.25% Convertible Notes has not been extended to a date that is after October 15, 2019, then the 8.0% Convertible Notes will mature on August 15, 2018. In addition, the maturity date of the asset-based credit facility will be (a) July 16, 2018 if we have not delivered to the administrative agent for the asset-based credit facility evidence by July 15, 2018 that the 4.25% Convertible Notes have been effectively discharged with the proceeds from the issuance of the 11.0% Unsecured Notes or (b) May 15, 2018 if (i) the issuance of the 11.0% Unsecured Notes is cancelled for any reason or (ii) the proceeds of the 11.0% Unsecured Notes are used for a purpose other than to effectively discharge the 4.25% Convertible Notes in full; provided, that if an event described in clause (i) or (ii) above occurs after May 15, 2018, then the maturity date of the asset-based credit facility will be the date the event occurred. On March 19, 2018, we entered into a note purchase agreement with two investment funds advised by Corre Partners Management, LLC to purchase $71.0 million of our 11% Unsecured Notes. Corre Partners Management and its affiliated funds, including the purchasers of the 11.0% Unsecured Notes, own a portion of our 4.25% Convertible Notes and 8.00% Convertible Notes. Prior to August 15, 2018, we may elect to issue the 11.0% Unsecured Notes and use the proceeds from the issuance of the 11.0% Unsecured Notes to effectively discharge the 4.25% Convertible Notes, in which case the maturity date of the 8.0% Convertible Notes would remain May 1, 2019. As a result, if the proceeds of the 11.0% Unsecured Notes were to be used to effectively discharge the 4.25% Convertible Notes prior to July 16, 2018, we would need to refinance (1) the asset-based credit facility on or prior to April 14, 2019, (2) to the extent they are not converted into our common stock, the 8.0% Convertible Notes on May 1, 2019 and (3) the 11.0% Unsecured Notes on or prior to October 16, 2019. Alternatively, if the market price of our common stock prior to August 15, 2018 is above $11.70 per share, we could elect to take no action with respect to the 4.25% Convertible Notes, in which case the maturity date of the 8.0% Convertible Notes would become August 15, 2018. We believe that under those circumstances most, if not all, of the holders of our 8.0% Convertible Notes would convert their notes into our common stock (and any remaining unconverted amounts could be refinanced with available cash or drawings under our asset-based credit facility) and we could issue the 11.0% Unsecured Notes by October 1, 2018 in order to repay the 4.25% Convertible Notes at maturity. In this case, we would seek to extend or refinance our asset-based credit facility. We may not have sufficient capital resources to repay all of our indebtedness as it becomes due, which could result in a default under all of our indebtedness. Our indebtedness agreements contain and the terms of any future indebtedness may contain significant operating and financial restrictions. These restrictions may limit our and certain of our subsidiaries’ operating flexibility and, in turn, hinder our ability to make payments on our obligations, impair our ability to make capital expenditures and/or increase the cost of obtaining additional financing. acceleration of the indebtedness or payment default under the asset-based credit facility would also be an event of default under the indenture governing our convertible notes (and our 11% Unsecured Notes, if issued). In addition, under our asset-based credit facility, if Excess Availability is less than the greater of $17.5 million or 17.5% of total availability, in each case for more than one business day, then a “Covenant Compliance Period” will exist until we have Excess Availability for a period of 30 consecutive days equal to or greater than the greater of (a) 17.5 % of the total availability and (b) $17.5 million. During each Covenant Compliance Period, we must maintain a minimum fixed charge coverage ratio of not less than 1.0 to 1.0 and a first lien leverage ratio of not greater than 5.0 to 1.0 for the four fiscal quarter period ended immediately prior to commencement of a Covenant Compliance Period and for every four fiscal quarter period ending during a Covenant Compliance Period. During the fiscal years ended January 31, 2018 and 2017, we were not subject to Covenant Compliance Period(s) under our asset-backed credit facility. If we had been in a Covenant Compliance Period during the three year period ended January 31, 2018, we would not have been in compliance with the minimum fixed charge coverage ratio. Furthermore, during a covenant Compliance Period or if an Event of Default has occurred and is continuing all of our funds received on a daily basis will be applied to reduce amounts owing under the asset-based credit facility. Although we do not anticipate being in a Covenant Compliance Period during the next twelve months, a Covenant Compliance Period could occur if the borrowing base is decreased for any of the reasons discussed above or if we are required to borrow more funds than is currently anticipated at a time when we do not meet the minimum fixed charge coverage ratio and the first lien leverage ratio. We cannot assure that waivers will be granted or amendments made to any of the agreements governing our indebtedness if for any reason we are unable to comply with the obligations thereunder or that we will be able to refinance our debt on acceptable terms, or at all, should we seek to do so. See Note 8 to the Consolidated Financial Statements for a more detailed description of our indebtedness. The conversion of our 4.25% Convertible Notes may adversely affect our financial condition. After May 15, 2018, holders of the 4.25% Convertible Notes will be entitled to convert such notes at any time at their option. If one or more holders elect to convert their 4.25% Convertible Notes, unless we elect to satisfy our conversion obligation by delivering solely shares of our common stock (other than paying solely cash in lieu of any fractional share), including if we have irrevocably elected full physical settlement upon conversion, we would be required to make cash payments to satisfy all or a portion of our conversion obligations based on the applicable conversion rate, which could adversely affect our liquidity. We may in certain circumstances elect to settle conversions of our 4.25% Convertible Notes in cash and the accounting method for convertible debt securities that may be settled in cash could have a material effect on our reported financial results. Pursuant to the terms of our 4.25% Convertible Notes, at our election, we will satisfy our conversion obligation by paying or delivering, as the case may be, cash, shares of our common stock or a combination of cash and shares of our common stock. We refer to these settlement methods as cash settlement, physical settlement and combination settlement, respectively. In May 2008, the Financial Accounting Standards Board, or FASB, issued FASB Staff Position No. APB 14-1, Accounting for Convertible Debt Instruments That May Be Settled in Cash Upon Conversion (Including Partial Cash Settlement), which has subsequently been codified as ASC Topic 470-20, “Debt with Conversion and Other Options”. ASC Topic 470-20 requires an entity to separately account for the liability and equity components of convertible debt instruments whose conversion may be settled entirely or partially in cash in a manner that reflects the issuer’s economic interest cost for non-convertible debt. During the first quarter of the fiscal year ended January 31, 2015, the liability component of the convertible debt instrument was valued at the fair value of a similar debt instrument that did not have an associated equity component and was reflected as a liability on the balance sheet. The equity component of the convertible debt instrument was included in the additional paid-in capital section of stockholders’ equity on the balance sheet and the value of the equity component was treated as original issue discount for purposes of accounting for the debt component. This original issue discount is being amortized to non-cash interest expense over the term of the convertible debt instrument. Accordingly, we record a greater amount of non-cash interest expense in current periods as a result of this amortization. We report lower net income in our financial results because ASC Topic 470-20 requires the interest expense associated with our 4.25% Convertible Notes to include both the current period’s amortization of the debt discount and our 4.25% Convertible Notes’ coupon interest, which could adversely affect our reported or future financial results, the trading price of our common stock and the trading price of our 4.25% Convertible Notes. If we elect to settle conversions using physical settlement, then we must include the full number of shares underlying our 4.25% Convertible Notes in the calculation of our diluted earnings per share, regardless of whether the contingent conversion feature of our 4.25% Convertible Notes is triggered. In addition, under certain circumstances, convertible debt instruments whose conversion may be settled entirely or partly in cash (such as our 4.25% Convertible Notes) are currently accounted for using the treasury stock method. Under this method, the shares issuable upon conversion of convertible notes are not included in the calculation of diluted earnings per share unless the conversion value of the convertible notes exceeds their principal amount at the end of the relevant reporting period. If the conversion value exceeds their principal amount, then, for diluted earnings per share purposes, convertible notes are accounted for as if the number of shares of common stock that would be necessary to settle the excess, if we elected to settle the excess in shares, are issued. Accordingly, the treasury stock method could result in more favorable reported diluted earnings per share. If we do not satisfy the criteria required to utilize the treasury stock method, we will be required to determine diluted earnings per share utilizing the “if converted” method, the effect of which is that the shares issuable upon conversion of the notes are included in the calculation of diluted earnings per share assuming the conversion of the notes at the beginning of the reporting period if the impact is dilutive. We cannot be sure that the accounting standards in the future will continue to permit the use of the treasury stock method. Additionally, we cannot be sure that we will satisfy the relevant criteria to utilize the treasury stock method. If we are unable to use the treasury stock method in accounting for the shares, if any, issuable upon conversion of our convertible notes, then our diluted earnings per share could be adversely affected. Conversion of our 8.0% Convertible Notes could dilute the ownership interests of our shareholders. Our 8.0% Convertible Notes are convertible, at the option of the holders, into consideration consisting of shares of our common stock (and cash in lieu of fractional shares) until the close of business on the scheduled trading day immediately preceding the maturity date. As of January 31, 2018, the conversion price of the 8.0% Convertible Notes ($11.70 per share) was significantly below the closing price of our common stock on that date ($13.49 per share). To the extent we issue common stock upon conversion of our 8.0% Convertible Notes, that conversion would dilute the ownership interests of our shareholders. If all the 8.0% Convertible Notes were to convert into shares of our common stock, we would issue approximately 8.5 million additional shares representing approximately 30.0% of the outstanding shares of our common stock on that date. We may not have the ability to raise the funds necessary to repurchase our convertible notes upon a fundamental change, asset sale or casualty or condemnation event, and our debt instruments may prohibit some of these payments. As discussed in Note 8 to the Consolidated Financial Statements, if a “fundamental change” (as defined in the indentures governing our convertible notes) occurs, holders of our convertible notes may require us to repurchase all or a portion of such notes in cash. Any such cash payment could be significant, and we may not have enough available cash or be able to obtain financing so that we can make payments on our convertible notes when due. In addition, except in very limited circumstances involving a refinancing of the 8.0% Convertible Notes in a manner permitted by our asset-based credit facility, our asset-based credit facility prohibits us from making or offering to make certain voluntary repurchases of the convertible notes, except that we may repurchase the 8.0% Convertible Notes if certain “payment conditions” are satisfied. This provision may prohibit us from repurchasing the convertible notes at the holders’ election following a fundamental change or, with respect to the 8.0% Convertible Notes, certain asset sales and casualty and condemnation events. If we fail to repurchase our convertible notes when required, we will be in default under the indentures for the convertible notes. In addition, such a failure could also be a default under our asset-based credit facility, which may allow the lenders under that agreement to cause all outstanding amounts under the facility to become immediately due and payable. Certain provisions in the indentures governing our convertible notes could delay or prevent an otherwise beneficial takeover or takeover attempt of us. Certain provisions in the indentures governing our convertible notes could make it more difficult or more expensive for a third party to acquire us. For example, if a takeover would constitute a fundamental change (as defined in the indentures governing our convertible notes), holders of our convertible notes will have the right to require us to repurchase their convertible notes in cash. In addition, if a takeover constitutes a make-whole fundamental change, we may be required to increase the conversion rate for holders who convert their convertible notes in connection with such takeover. In either case and in other cases, our obligations under our convertible notes and the indentures could increase the cost of acquiring us or otherwise discourage a third party from acquiring us. Provisions in our organizational documents, Delaware law and the indentures governing our convertible notes could prevent or frustrate attempts by stockholders to replace our current management or effect a change of control of Layne. Our certificate of incorporation, bylaws and the Delaware General Corporation Law contain provisions that could make it more difficult for a third party to acquire us without consent of our board of directors. In addition, under our certificate of incorporation, our board of directors may issue shares of preferred stock and determine the terms of those shares of stock without any further action by our stockholders. Our issuance of preferred stock could make it more difficult for a third party to acquire a majority of our outstanding voting stock and thereby effect a change in the composition of our board of directors. Our certificate of incorporation also provides that our stockholders may not take action by written consent. Our bylaws require advance notice of stockholder proposals and nominations and permit only our board of directors, or authorized committee designated by our board of directors, to call a special stockholder meeting. These provisions may have the effect of preventing or hindering attempts by our stockholders to replace our current management. In addition, Delaware law prohibits us from engaging in a business combination with any holder of 15% or more of our capital stock until the holder has held the stock for three years unless, among other possibilities, our board of directors approves the transaction. Our board may use this provision to prevent changes in our management. Also, under applicable Delaware law, our board of directors may adopt additional anti-takeover measures in the future. In addition, provisions of Delaware law may also discourage, delay or prevent a third party from acquiring or merging with us or obtaining control of Layne. If a “fundamental change” (as such terms are defined in the indentures governing our convertible notes) occurs, holders of the convertible notes will have the right, at their option, to require us to repurchase all or a portion of their convertible notes. A “fundamental change” generally occurs when there is a change in control of Layne (acquisition of 50% or more of our voting stock, liquidation or sale of Layne not for stock) or trading of our stock is terminated. In the event of a “make-whole fundamental change” (as is defined in the indentures for the convertible notes), we may also be required to increase the conversion rate applicable to the convertible notes surrendered for conversion in connection with such make-whole fundamental change. A “make-whole fundamental change” is generally a sale of Layne not for stock in another publicly traded company. In addition, the indentures for the convertible notes prohibit us from engaging in certain mergers or acquisitions unless, among other things, the surviving entity assumes our obligations under the convertible notes. The market price of our common stock could be reduced by future issuances or sales of our common stock. Sales by us or our shareholders of a substantial number of shares of our common stock in the public market, or the perception that these sales might occur, could cause the market price of our common stock to decline or could impair our ability to raise capital through a future sale of, or pay for acquisitions using, our equity securities. In addition to outstanding shares eligible for future sale, as of January 31, 2018, 2.0 million shares of our common stock were issuable, subject to vesting requirement, under currently outstanding stock options and restricted stock units granted to officers, directors and employees and an additional 0.7 million shares are available to be granted under our stock option and employee incentive plans. We are restricted from paying dividends. We have not paid any cash dividends on our common stock since our initial public offering in 1992 and we do not anticipate paying any cash dividends in the foreseeable future. In addition, our current credit arrangements restrict our ability to pay cash dividends. Our share price has been volatile and could decline, resulting in a substantial or complete loss of your investment. Because the trading of our common stock is characterized by low trading volume, it could be difficult for you to sell the shares of our common stock that you hold. These factors may lower the trading price of our common stock, regardless of our actual operating performance and could prevent you from selling your common stock at or above the price that you paid for the common stock. In addition, the stock markets, from time to time, experience extreme price and volume fluctuations that may be unrelated or disproportionate to the operating performance of companies. These broad fluctuations may lower the market price of our common stock. Information concerning additional risk factors related to the pending merger with Granite Construction Incorporated (“Granite”) is available in the preliminary proxy statement/prospectus included in the Registration Statement on Form S-4 that Granite filed with the SEC on March 13, 2018, in connection with the pending stock merger. Layne’s business relationships may be subject to disruption due to uncertainty associated with the merger. Parties with which Layne does business may experience uncertainty associated with the proposed merger, including with respect to current or future business relationships with Layne or the combined company. Layne’s business relationships may be subject to disruption as customers, distributors, suppliers, vendors and others may attempt to negotiate changes in existing business relationships or consider entering into business relationships with parties other than Layne or the combined company. These disruptions could have an adverse effect on the businesses, financial condition, or results of operations of Layne and/or the combined company. The risk, and adverse effect, of such disruptions could be exacerbated by a delay in consummating the merger or termination of the merger agreement. The merger may be consummated on different terms from those contained in the merger agreement. Prior to the consummation of the merger, the parties may, by their mutual agreement, amend or alter the terms of the merger agreement, including with respect to, among other things, the consideration to be received by Layne stockholders, or any covenants or agreements with respect to the parties’ respective operations during the pendency thereof, provided, however, that after approval by Layne stockholders, no amendment may be made without further stockholder approval which, by law or in accordance with the rules of Nasdaq, requires further approval by such stockholders. Any such amendments or alterations may have negative consequences to Layne stockholders including, among other things, reducing the cash available for Granite’s or Layne’s operations or to meet respective obligations or restricting or limiting assets or operations of either of Granite or Layne. Under certain circumstances, Layne stockholders may be permitted or required to adopt any such amendments, which could delay consummation of the Merger and subject Layne and Granite to additional expense. Layne must obtain approval of its stockholders to consummate the Merger, which, if delayed or not obtained, may jeopardize or delay the consummation of the Merger. The Merger is conditioned on the adoption of the merger agreement by the affirmative vote of the holders of a majority of the issued and outstanding shares of Layne Common Stock entitled to vote thereon. If Layne stockholders do not adopt the merger agreement, then Layne and Granite cannot consummate the Merger. The merger agreement contains provisions that limit Layne’s ability to pursue alternatives to the merger, which could discourage a potential acquirer of Layne from making an alternative transaction proposal or could result in a competing proposal being at a lower price than it might otherwise be and, in certain circumstances, could require Layne to pay Granite a significant termination fee. The merger agreement contains “no shop” provisions that, subject to limited exceptions, require that Layne may not (a) solicit, initiate, cause or knowingly facilitate or encourage the submission of any inquiries, proposals or offers or any other efforts or attempts that constitute or may reasonably be expected to lead to any acquisition proposal (generally, a proposal to acquire 20% or more of the common stock or assets of Layne), or engage in any discussions or negotiations with respect thereto or otherwise cooperate with or assist or participate in, or knowingly facilitate or encourage, any such inquiries, proposals, discussions or negotiations, or resolve to or publicly propose to take any of the foregoing actions, (b) approve or recommend, or resolve to or publicly propose to approve or recommend, any acquisition proposal or enter into any merger agreement, agreement-in-principle, letter of intent, share purchase agreement, asset purchase agreement, share exchange agreement, option agreement or other similar agreement relating to an acquisition proposal or enter into any letter of intent, agreement or agreement-in-principle requiring Layne to abandon, terminate or fail to consummate the Merger or (c) (1) withdraw, modify or qualify in a manner adverse to Granite the recommendation of the Layne Board or the approval or declaration of advisability by the Layne Board of the merger agreement and the transactions contemplated thereby (including the Merger) or (2) approve or recommend, or resolve to or publicly propose to approve or recommend, any acquisition proposal. The merger agreement also provides that Layne will be required to pay a termination fee of $16.0 million to Granite upon termination of the merger agreement under certain circumstances. These provisions might discourage a potential competing acquiror that might have an interest in acquiring all or a significant part of Layne from considering or proposing an acquisition even if it were prepared to pay consideration with a higher per share market price than that proposed in the Merger, or might result in a potential competing acquiror proposing to pay a lower per share price to acquire Layne than it might otherwise have proposed to pay. We have no unresolved comments from the Securities and Exchange Commission staff. The term of the lease expires in 2025 and has two, five-year extensions. We have subleased approximately 19,000 square feet of our corporate facilities under a sublease agreement that expires in 2025. We have leased approximately 50% of our Orleans office building to the purchaser of our Heavy Civil business under a lease agreement that expires in 2022. We are, from time to time, a party to legal or regulatory proceedings arising in the ordinary course of our business. The discussion in Note 15 to the Consolidated Financial Statements included elsewhere in this Form 10-K is incorporated herein by reference. Currently, there are no other legal or regulatory proceedings that management believes, either individually or in the aggregate, would have a material adverse effect upon our consolidated financial statements. In accordance with GAAP, we record a liability when it is both probable that a liability has been incurred and the amount of the loss can be reasonably estimated. These liabilities are reviewed at least quarterly and adjusted to reflect the impacts of negotiations, settlements, rulings, advice of legal counsel and other information and events pertaining to a particular case or proceeding. The operations Layne performs on mine sites are subject to regulation by the Federal Mine Safety and Health Administration under the Federal Mine Safety and Health Act of 1977. Information concerning mine safety violations or other regulatory matters required by Section 1503(a) of the Dodd-Frank Act and Item 104 of Regulation S-K is included in Exhibit 95 to this Form 10-K.
Our common stock is traded on the NASDAQ Global Select Market under the symbol LAYN. The following table sets forth the range of high and low sales prices of our stock by quarter for the fiscal years ended January 31, 2018 and 2017, as reported by the NASDAQ Global Select Market. At March 26, 2018, there were 162 owners of record of our common stock. We have not paid any cash dividends on our common stock. Moreover, our Board of Directors does not anticipate paying any cash dividends in the foreseeable future. Future dividend policy will depend on a number of factors including our future earnings, capital requirements, financial condition and prospects and such other factors as the Board of Directors may deem relevant, as well as restrictions under our indebtedness agreements. Our indebtedness agreements currently contain restrictions on our ability to pay cash dividends. 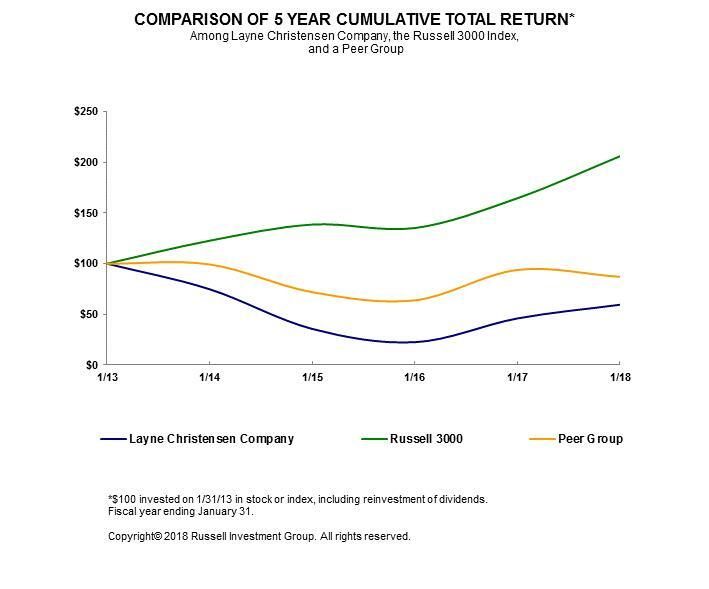 The following graph provides a comparison of our five-year, cumulative total shareholder return from January 31, 2013 through January 31, 2018 to the return of the Russell 3000 and a custom peer group selected by Layne. The peer group includes Aegion Corp, Boart Longyear Ltd, Foraco International Sa, Forage Orbit Garant Inc, Major Drilling Group International Inc, Matrix Service Co, Primoris Services Corp and Tutor Perini Corp. The comparisons shown in the graph are based on historical data. The stock price performance shown in the graph is not necessarily indicative of, nor is it intended to forecast, the potential future performance of Layne’s common stock. Information used in the graph was obtained from Russell Investment Group, a source believed to be reliable, but we are not responsible for any errors or omission in such information. Nuverra Environmental Solutions, Inc., which was included in the peer group in the Form 10-K for the fiscal year ended January 31, 2017, is not included in the peer group for purposes of this performance graph. We elected to remove Nuverra Environmental Solutions, Inc. from the peer group as a result of its filing for bankruptcy in 2017. The following performance graph and related text are being furnished to and not filed with the SEC and will not be deemed to be “soliciting material” or subject to Regulation 14A or 14C under the Exchange Act or to the liabilities of Section 18 of the Exchange Act and will not be deemed to be incorporated by reference into any filing under the Securities Act of 1933 or the Exchange Act, except to the extent we specifically incorporate such information by reference into such filing. The following selected historical financial information as of and for each of the five fiscal years ended January 31, 2018, has been derived from our audited Consolidated Financial Statements. All periods presented below reflect the effects of operations discontinued during each of the years in the table below. The information below should be read in conjunction with “Management’s Discussion and Analysis of Financial Condition and Results of Operations” under Item 7 and the Consolidated Financial Statements and notes thereto under Item 8 included elsewhere in this Form 10-K.
During the fiscal year ended January 31, 2018, we sold our Heavy Civil business. We have accounted for it as a discontinued operation for all periods presented. See Note 4 to the Consolidated Financial Statements for a discussion of impairment charges recorded during the fiscal year ended January 31, 2016. During the fiscal year ended January 31, 2016, we recognized a gain on extinguishment of debt of $4.2 million in connection with the partial redemption of the 4.25% Convertible Notes in exchange for 8.0% Convertible Notes. Our income tax benefit for the fiscal year ended January 31, 2018 included an $8.8 million reversal of accrued foreign taxes recorded in prior years. A $73.4 million valuation allowance on deferred tax assets was recorded during the fiscal year ended January 31, 2014. Of the $73.4 million valuation allowance, $54.4 million related to deferred tax assets established in a prior year and $19.0 million related to deferred tax assets established in the current year. During the fiscal year ended January 31, 2016, we sold our Geoconstruction business. We have accounted for it as a discontinued operation for all periods presented. During the fiscal year ended January 31, 2015, we sold Costa Fortuna and Tecniwell, both previously reported in the Geoconstruction operating segment. We have accounted for these businesses as discontinued operations for all periods presented. During the fiscal year ended January 31, 2014, we accounted for our SolmeteX operation, which was sold on July 31, 2013, as a discontinued operation. Primarily represents the 4.25% Convertible Notes with a maturity date of November 15, 2018. The following discussion and analysis of financial condition and results of operations should be read in conjunction with our consolidated financial statements and notes thereto under Item 8. This Form 10-K may contain forward-looking statements within the meaning of Section 27A of the Securities Act of 1933 and Section 21E of the Exchange Act of 1934. Such statements may include, but are not limited to, statements of plans and objectives, statements of future economic performance and statements of assumptions underlying such statements and statements of management’s intentions, hopes, beliefs, expectations or predictions of the future. Forward-looking statements can often be identified by the use of forward-looking terminology, such as “should,” “intended,” “continue,” “believe,” “may,” “hope,” “anticipate,” “goal,” “forecast,” “plan,” “estimate” and similar words or phrases that convey the uncertainty of future events or outcomes. Such statements are based on current expectations and are subject to certain risks, uncertainties and assumptions, including but not limited to: estimates and assumptions regarding our strategic direction and business strategy, the timely and effective execution of turnaround strategy for Water Resources, the continuing recovery in the mining industry, prevailing prices for various commodities, the timing and extent of future oil and gas drilling and production in the Delaware Basin, longer term weather patterns, unanticipated slowdowns in our major markets, the availability of credit, the risks and uncertainties normally incident to our drilling and infrastructure services industries, the impact of competition, the availability of equity or debt capital needed for our business, including the refinancing of our existing indebtedness as it matures, worldwide economic and political conditions and foreign currency fluctuations that may affect our results of operations. Should one or more of these risks or uncertainties materialize, or should underlying assumptions prove incorrect, actual results may vary materially and adversely from those anticipated, estimated or projected. Many of the factors that will impact our risk factors are beyond our ability to control or predict. Should one or more of these risks or uncertainties materialize, or should underlying assumptions prove incorrect, actual results may vary materially and adversely from those anticipated, estimated or projected. These forward-looking statements are made as of the date of this filing and we assume no obligation to update such forward-looking statements or to update the reasons why actual results could differ materially from those anticipated in such forward-looking statements. We are a global water management, infrastructure services and drilling company, providing responsible solutions to the world of essential natural resources – water minerals and energy. We offer innovative, sustainable products and services with an enduring commitment to safety, excellence and integrity. We primarily operate in North America and Brazil. Our customers include government agencies, investor-owned utilities, industrial companies, global mining companies, consulting engineering firms, oil and gas companies, power companies and agribusinesses. We have ownership interest in certain foreign affiliates operating in Latin America. We manage and report our operations through three segments: Water Resources, Inliner and Mineral Services. Our operations are cyclical and subject to seasonality. Drilling and infrastructure services activities and revenues tend to decrease during the months of November through January. During the first quarter of the fiscal year ended January 31, 2018, we sold our Heavy Civil business. The operating results of the Heavy Civil business are presented as discontinued operations and, as such, have been excluded from continuing operations and segment results for all periods presented. See Note 16 to the Consolidated Financial Statements for further discussion. The sale of Heavy Civil business closed on April 30, 2017. During the fiscal year ended January 31, 2018, we made significant progress in developing and expanding our new Water Midstream business reported in our Water Resources segment. During the year, we completed our initial water pipeline infrastructure system serving energy producers in the Delaware Basin in West Texas, which we refer to as the Hermosa Pipeline. Our new Water Midstream business is anchored by nearly 1,000 acres of Company-owned, water-producing land near Pecos, TX and consists of a high capacity 22-inch diameter pipeline of more than 26 miles in length, 750,000 barrels of storage through two lined, in-ground storage ponds near the water wells and associated pump stations. We have the ability to deliver water at multiple points along the pipeline route. The system has production and delivery capacity of 175,000 barrels per day of non-potable water, with capacity to support further anticipated expansion from both additional water sources and delivery points. The capital investment for the Hermosa Pipeline system and the extension, including land and right of way costs, is approximately $22.0 million. Additionally, during the fiscal year ended January 31, 2018, we entered into a long-term agreement with the Texas General Land Office (“GLO”) that provides Layne with the exclusive right to develop GLO non-potable water resources for oil and gas drilling and completion activities on approximately 88,000 acres interspersed across Reeves and Culberson counties in the Delaware Basin oil and gas producing region of Texas. Revenues increased $10.7 million, or 2.3%, to $475.5 million, for the fiscal year ended January 31, 2018 compared to $464.8 million for the fiscal year ended January 31, 2017. The increase in revenues was primarily due to increased drilling activity in Mineral Services in the western U.S. and Mexico and increased activity levels in Inliner. This increase was partially offset by Water Resources’ reduced drilling primarily in the western and mid-western U.S. stemming from increased precipitation in the region and lower levels of collector well activity. Cost of revenues (exclusive of depreciation, amortization) decreased $7.3 million, to $374.8 million (78.8% of revenues) for the fiscal year ended January 31, 2018 compared to $382.1 million (82.2% of revenues) for the fiscal year ended January 31, 2017. Cost of revenues as a percentage of revenues for the fiscal year ended January 31, 2018 decreased from the prior year primarily as a result of Water Resources’ completion of certain loss projects in the prior year and improved margins in Mineral Services due to an increase in market activity. Selling, general and administrative expenses decreased $2.2 million, or 2.8%, to $74.4 million for the fiscal year ended January 31, 2018 compared to $76.6 million for the fiscal year ended January 31, 2017. The prior year included a $2.2 million value added tax recovery in Mineral Services. Excluding the tax recovery in the prior year, selling, general and administrative expenses decreased $4.4 million reflecting lower costs at Inliner and Water Resources with the primary reduction reflected in unallocated corporate overhead costs of $3.2 million, which included lower legal and professional fees and compensation related expenses partially offset by an increase in incentive compensation expense related to improved operating performance. Depreciation and amortization increased $1.4 million, or 5.5%, to $26.7 million, for the fiscal year ended January 31, 2018 compared to $25.3 million for the fiscal year ended January 31, 2017. The increase is primarily due to higher capital expenditures over the past year. Restructuring costs of $4.9 million for the fiscal year ended January 31, 2018 compared to $16.9 million for the fiscal year ended January 31, 2017. Restructuring costs primarily related to finalizing tax issues and exit costs in Africa and Australia and costs associated with our Water Resources Business Performance Initiative initiated in the fiscal year ended January 31, 2017. Income tax (benefit) expense from continuing operations of ($10.4) million was recorded for the fiscal year ended January 31, 2018 compared to $1.4 million for the fiscal year ended January 31, 2017. We currently record no tax benefit on domestic deferred tax assets and certain foreign deferred tax assets. The effective tax rate for the fiscal year ended January 31, 2018 was 68.1% compared to (3.1%) for the fiscal year ended January 31, 2017.
allowance. The remaining $1.1 million in tax expense was primarily related to foreign withholding taxes on dividends and tax expense recorded by our Mexican subsidiary. The differences between the effective tax rates and the statutory tax rate for fiscal years ended January 31, 2018 (exclusive of items noted above) and January 31, 2017 resulted primarily from valuation allowances recorded during each period on current year losses. Net loss from discontinued operations of $22.4 million was recorded for the fiscal year ended January 31, 2018 compared to net loss from discontinued operations of $5.2 million for the fiscal year ended January 31, 2017. Discontinued operations in the current year included the loss on sale of our Heavy Civil business of $19.0 million. Revenues for Water Resources decreased $32.2 million, or 15.7%, to $172.4 million, for the fiscal year ended January 31, 2018 compared to $204.6 million for the fiscal year ended January 31, 2017. The decline in revenues was primarily due to decrease in agricultural drilling projects related to increased precipitation in the western and mid-western U.S. over the course of the past two years. Adjusted EBITDA increased $7.7 million, or 319.3%, to $5.3 million, for the fiscal year ended January 31, 2018 compared to ($2.4) million for the fiscal year ended January 31, 2017. The increase in Adjusted EBITDA primarily reflects better performance on projects and less project execution issues. Revenues for Inliner increased $9.0 million, or 4.6%, to $205.9 million, for the fiscal year ended January 31, 2018 compared to $196.8 million for the fiscal year ended January 31, 2017. Revenues were higher compared to the prior year period due overall increased in business primarily in the Midwest and an increase in large diameter pipe installation. Adjusted EBITDA increased $0.7 million, or 2.0%, to $32.7 million, for the fiscal year ended January 31, 2018 compared to $32.0 million for the fiscal year ended January 31, 2017. The increase in Adjusted EBITDA was driven primarily by the revenue increase compared to the prior year. Revenues for Mineral Services increased $33.5 million, or 52.5%, to $97.2 million, for the fiscal year ended January 31, 2018 compared to $63.8 million for the fiscal year ended January 31, 2017. Revenues increased from the prior year period due to increased market activity in the western U.S. and Mexico. Adjusted EBITDA increased $8.7 million, or 101.0%, to $17.4 million for the fiscal year ended January 31, 2018 compared to $8.6 million for the fiscal year ended January 31, 2017. The increase in Adjusted EBITDA was primarily due to increased activity and profitability in the western U.S. and Mexico compared to the prior year period. Unallocated corporate expenses primarily consist of general and administrative functions performed on a company-wide basis and benefiting all operating segments. These costs include expenses related to accounting, financial reporting, internal audit, treasury, legal, tax compliance, executive management and board of directors. Unallocated corporate expenses reflected in our Adjusted EBITDA were $20.3 million for the fiscal year ended January 31, 2018 compared to $23.8 million for the fiscal year ended January 31, 2017. The improvement was primarily due to reductions in legal, professional and consulting fees partially offset by an increase in incentive compensation expense due to our improved performance. Revenues decreased $53.3 million, or 10.3%, to $464.8 million, for the fiscal year ended January 31, 2017 compared to $518.1 million for the fiscal year ended January 31, 2016. The decrease in revenues was primarily due to declines in Mineral Services reflecting the exit from operations in Africa and Australia and weak market conditions during the first half of the year, and decreased drilling activity levels in the western U.S. in Water Resources due to significant precipitation levels in the region. Cost of revenues (exclusive of depreciation, amortization and impairment charges) decreased $37.8 million, to $382.1 million (82.2% of revenues) for the fiscal year ended January 31, 2017 compared to $419.9 million (81.0% of revenues) for the fiscal year ended January 31, 2016. Cost of revenues as a percentage of revenues for the fiscal year ended January 31, 2017 increased from the prior year, primarily due to a $7.9 million write down of inventory in the prior year combined with improved margins in Inliner. Inliner’s margins increased primarily due to the product mix of contracts combined with increased crew efficiency during the fiscal year ended January 31, 2017. Selling, general and administrative expenses decreased $12.6 million, or 14.1%, to $76.6 million for the fiscal year ended January 31, 2017 compared to $89.2 million for the fiscal year ended January 31, 2016. The decrease was primarily due to reduced Corporate overhead costs, including reductions in legal and professional fees and compensation expenses. Depreciation and amortization decreased $4.8 million, or 15.9%, to $25.3 million, for the fiscal year ended January 31, 2017 compared to $30.1 million for the fiscal year ended January 31, 2016. The decrease represents reductions in capital expenditures and the disposal or write down of assets. These decreases were partially offset by increased depreciation related to additional capital expenditures in Inliner to expand crews and manufacturing capabilities. Equity in earnings (losses) of affiliates improved to earnings of $2.7 million for the fiscal year ended January 31, 2017 compared to a loss of $0.6 million for the fiscal year ended January 31, 2016, primarily due to increased margins from our affiliates in Chile. Restructuring costs of $16.9 million were recorded for the fiscal year ended January 31, 2017 compared to $9.2 million for the fiscal year ended January 31, 2016. Restructuring costs for the fiscal year ended January 31, 2017 primarily related to the closure of our Australian and African entities resulting in the impairment of our assets held for sale. In calculating the impairment, the carrying amount of the assets included the cumulative currency translation adjustment related to our Australian and African entities. Also included, are the restructuring costs associated with our Water Resources Business Performance Initiative, as discussed in Note 18 to the Consolidated Financial Statements. For the fiscal year ended January 31, 2016, restructuring costs related to $3.9 million in asset write-downs, combined with $5.3 million of severance and other costs, as part of our exit from Africa and Australia. unamortized deferred financing fees as a result of the reduction in the borrowing base available under the asset-based credit facility during the third quarter of the fiscal year ended January 31, 2016. Income tax expense from continuing operations of $1.4 million was recorded for the fiscal year ended January 31, 2017 compared to $0.7 million for the fiscal year ended January 31, 2016. We recorded no tax benefit on domestic deferred tax assets and certain foreign deferred tax assets. The effective tax rate for the fiscal year ended January 31, 2017 was (3.1%) compared to (1.5%) for the fiscal year ended January 31, 2016. The differences between the effective tax rates and the statutory tax rate resulted primarily from valuation allowances recorded during each period on current year losses. Net loss from discontinued operations of $5.2 million for the fiscal year ended January 31, 2017, primarily related to a loss from operations of our Heavy Civil operations. Net income from discontinued operations of $3.5 million for the fiscal year ended January 31, 2016, primarily related to the gain on the sale of our Geoconstruction business. Revenues for Water Resources decreased $35.3 million, or 14.7%, to $204.6 million, for the fiscal year ended January 31, 2017 compared to $239.9 million for the fiscal year ended January 31, 2016. The decline in revenues was primarily due to reduced activity in agricultural drilling projects in the western U.S. stemming largely from increased precipitation during the fiscal year ended January 31, 2017 and lower pump and well-related equipment sales. Adjusted EBITDA decreased $26.3 million to ($2.4) million, for the fiscal year ended January 31, 2017 compared to $23.9 million for the fiscal year ended January 31, 2016. The decrease in Adjusted EBITDA was primarily due to reduced drilling activity described above, higher maintenance costs on equipment and higher costs and margin degradation on several large water well and injection well drilling projects. Revenues for Inliner increased $3.1 million, or 1.6%, to $196.8 million, for the fiscal year ended January 31, 2017 compared to $193.7 million for the fiscal year ended January 31, 2016. Revenues increased due in part to the increase in the number of crews, from 34 at the start of fiscal year ended January 31, 2016 to 38 crews at the end of fiscal year ended January 31, 2017. Increased activity and a favorable product mix of a higher volume of larger diameter pipe projects also contributed to the increase in revenues. Adjusted EBITDA increased $4.1 million, or 14.6%, to $32.0 million, for the fiscal year ended January 31, 2017 compared to $27.9 million for the fiscal year ended January 31, 2016. The increase in Adjusted EBITDA represents improved results across most operating regions as compared to the prior year. The increase in Adjusted EBITDA as a percentage of revenues was attributable to a higher volume of large diameter pipe installations combined with increased crew efficiency. Revenues for Mineral Services decreased $22.6 million, or 26.2%, to $63.8 million, for the fiscal year ended January 31, 2017 compared to $86.4 million for the fiscal year ended January 31, 2016. Revenues declined primarily due to our exit from our operations in Africa and Australia during the fiscal year ended January 31, 2016, which contributed to approximately $12.4 million in revenue decline for the fiscal year ended January 31, 2017, compared to the prior year. Lower activity levels in the United States and Mexico during the first half of the fiscal year ended January 31, 2017, also contributed to the decline in revenues. Adjusted EBITDA increased $6.7 million, or 359.8%, to $8.6 million for the fiscal year ended January 31, 2017 compared to $1.9 million for the fiscal year ended January 31, 2016. The increase in Adjusted EBITDA was due to a $2.2 million value added tax recovery during the current year, $1.1 million increased dividends received from our Latin American affiliates and increased margins in Brazil and Mexico. Unallocated corporate expenses reflected in our Adjusted EBITDA were $23.8 million for the fiscal year ended January 31, 2017 compared to $29.3 million for the fiscal year ended January 31, 2016. The improvement was primarily due to reductions in legal and professional fees and compensation expenses related to reduced headcount. Management does not believe the operations for the periods discussed have been significantly adversely affected by inflation or changing prices from its suppliers. Our primary source of liquidity is cash flow generated from operations, with the ability to supplement cash flow with borrowings under our credit facilities or issuances of debt. Our cash flow is affected by prices of raw materials, demand for our services, weather and seasonal conditions, operational risks, volatility in commodity prices, industry and economic conditions and conditions in the global markets. As of January 31, 2018, our total liquidity was $107.5 million, consisting of Excess Availability under our asset-based credit facility and total cash and cash equivalents. Our cash and cash equivalents as of January 31, 2018, were $32.0 million compared to $69.0 million as of January 31, 2017. The decrease in cash primarily reflects investments in our operations through capital expenditures during the year, primarily in our Water Midstream business. Cash and cash equivalents held by foreign subsidiaries as of January 31, 2018 were $5.8 million compared to $8.2 million as of January 31, 2017. No amounts held by foreign subsidiaries at January 31, 2018 were subject to repatriation restrictions. If cash held at our foreign subsidiaries is repatriated to the U.S., it may be subject to withholding taxes in the jurisdiction where the subsidiary is incorporated. The remittance will not be subject to additional U.S. taxation. As we continue to wind down our subsidiaries in Africa and Australia, we expect that any remaining residual cash will be treated as repayment of intercompany loans. Our working capital was ($4.7) million as of January 31, 2018 and $105.5 million as of January 31, 2017. Adjusted Working Capital (working capital excluding cash and cash equivalents of $32.0 million and $69.0 million at January 31, 2018 and 2017, respectively, and working capital from discontinued operations at January 31, 2017 of $19.6 million), decreased $53.6 million to ($36.7) million as of January 31, 2018 from $16.9 million as of January 31, 2017, primarily due to our 4.25% Convertible Notes becoming current and cash used in investing activities for capital expenditures during the fiscal year ended January 31, 2018. See Key Fiscal Year 2018 Events above for more discussion. For the fiscal year ended January 31, 2018, the cash provided by operating activities primarily reflected our net loss, adjusted for non-cash items and changes in components of our working capital. Fluctuations in working capital are normal in our business. Working capital is impacted by the size of our projects, timing of project start dates and completion dates and the achievement of billing milestones on backlog as we complete certain phases of the project. Cash provided by operating activities was $7.0 million for the fiscal year ended January 31, 2018 compared to $13.8 million for the fiscal year ended January 31, 2017. The primary impact is the change in working capital items with cash provided of $18.2 million in the prior year compared to a use of cash of $13.6 million in the current year. This change was driven by accounts receivable and costs and estimated earnings in excess of billings on uncompleted contracts activity levels. The change in accounts receivable compared to the prior year was heavily weighted in Mineral Services. Partially offsetting our use of cash for working capital was a lower net loss, excluding non-cash items of $27.7 million, due to lower unallocated corporate expenses combined with improved earnings in Inliner and Mineral Services. Cash provided by (used in) operating activities was $13.8 million for the fiscal year ended January 31, 2017 compared ($1.8) million to the prior year. This increase was primarily due to higher cash inflows from changes in customer receivables and costs and estimated earnings in excess of billings on uncompleted contracts of $35.8 million due to improved working capital management combined with lower activity levels and the completion of projects. These increases were partially offset by a higher use of cash on accounts payable and accrued expenses of ($6.2) million primarily from timing with our vendors combined with a higher net loss, excluding non-cash items, of ($15.2) million compared to the prior year. Cash (used in) provided by investing activities was ($42.4) million, ($11.9) million and $23.2 million for the fiscal years ended January 31, 2018, 2017 and 2016, respectively. Cash used in investing activities for the fiscal years ended January 31, 2018, 2017 and 2016 consisted primarily of capital expenditures partially offset by the sale of fixed assets. We are selectively investing capital, while continuing to dispose of underutilized assets. As discussed in Key Fiscal Year 2018 Events above, during the fiscal year ended January 31, 2018 we completed our initial water pipeline infrastructure system in our Water Midstream business. We had additional capital expenditures implementing an accounting system upgrade. These uses were partially offset by the proceeds from the sale of our Heavy Civil business of $3.5 million, also discussed in Key Fiscal Year 2018 Events above. Cash used in investing activities for the fiscal year ended January 31, 2016 also includes proceeds from the sale of our Geoconstruction business of $42.3 million. Cash flows (used in) provided by financing activities were ($0.2) million, ($0.1) million and $21.9 million for the fiscal years ended January 31, 2018, 2017 and 2016, respectively. Cash provided by financing activities for the fiscal year ended January 31, 2016 primarily relates to proceeds from the issuance of 8.0% Convertible Notes, partially offset by net payments on our asset-based credit facility. Below is a summary of certain provisions of our credit facility and debt instruments. For more information about our indebtedness, see Note 8 to the Consolidated Financial Statements in this Form 10-K.
4.25% Convertible Senior Notes due 2018. We have outstanding $69.5 million in aggregate principal amount of our 4.25% Convertible Notes as of January 31, 2018. The 4.25% Convertible Notes bear interest payable semi-annually in arrears in cash on May 15 and November 15 of each year. See “11.0% Unsecured Notes” below. The 4.25% Convertible Notes mature on November 15, 2018, unless earlier repurchased, redeemed or converted. The 4.25% Convertible Notes are contingently convertible, at the option of the holders, into consideration consisting of, at our election, cash, shares of our common stock or a combination of cash and shares of our common stock (and cash in lieu of fractional shares) until the close of business on the scheduled trading day immediately preceding May 15, 2018. The initial conversion rate was 43.6072 shares of our common stock per $1,000 principal amount of 4.25% Convertible Notes (which is equivalent to an initial conversion price of approximately $22.93 per share of our common stock). The conversion rate will be subject to adjustment upon the occurrence of certain events. In addition, we may be obligated to increase the conversion rate for any conversion that occurs in connection with a “fundamental change” (as defined in our 4.25% Convertible Notes Indenture). Convertible Notes will have the right, at their option, to require us to repurchase their 4.25% Convertible Notes in cash at a price equal to 100% of the principal amount of the 4.25% Convertible Notes to be repurchased, plus accrued and unpaid interest to, but excluding, the fundamental change repurchase date. The pending merger with Granite is not a fundamental change under the indenture governing the 4.25% Convertible Notes. In the merger agreement, Granite agreed that any conversions of the 4.25% Convertible Notes after the closing of the merger would be settled solely in cash. 8.0% Senior Secured Second Lien Convertible Notes. We have outstanding $99.9 million in aggregate principal amount of our 8.0% Convertible Notes as of January 31, 2018. The 8.0% Convertible Notes bear interest at a rate of 8.0% per annum, payable semi-annually in arrears on May 1 and November 1 of each year. The 8.0% Convertible Notes will mature on May 1, 2019; provided, however, that, unless all of the 4.25% Convertible Notes (or any permitted refinancing indebtedness in respect thereof) have been redeemed, repurchased, otherwise retired, discharged in accordance with their terms or converted into our common stock, or have been effectively discharged, in each case on or prior to August 15, 2018 or the scheduled maturity date of the 4.25% Convertible Notes (or any permitted refinancing indebtedness incurred in respect thereof) is extended to a date that is after October 15, 2019, the 8.0% Convertible Notes will mature on August 15, 2018. See "11.0% Unsecured Notes" below. The 8.0% Convertible Notes are convertible, at the option of the holders, into consideration consisting of shares of our common stock (and cash in lieu of fractional shares) until the close of business on the scheduled trading day immediately preceding the maturity date. No holder will have the right to convert any 8.0% Convertible Notes into shares of common stock to the extent that the conversion would cause that holder to beneficially own more than 9.9% of the shares of our common stock then outstanding after giving effect to the proposed conversion. The initial conversion rate was 85.4701 shares of our common stock per $1,000 principal amount of 8.0% Convertible Notes (equivalent to an initial conversion price of approximately $11.70 per share of our common stock). The conversion rate is subject to adjustment upon the occurrence of certain events. In addition, we may be obligated to increase the conversion rate for any conversion that occurs in connection with a “fundamental change” (as defined in our 8.0% Convertible Notes Indenture) or our call of the 8.0% Convertible Notes for redemption. At any time prior to the maturity date, we may redeem for cash all, but not less than all, of the 8.0% Convertible Notes; provided, however, that we may not redeem the 8.0% Convertible Notes on a redemption date that is outside an Open Redemption Period (as defined in the 8.0% Convertible Notes Indenture) unless the last reported sale price of our common stock equals or exceeds 140% of the conversion price of the 8.0% Convertible Notes in effect on each of at least 20 trading days during the 30 consecutive trading day period ending on and including, the trading day immediately preceding the date on which we deliver the redemption notice. In addition, upon the occurrence of a “fundamental change”, holders of the 8.0% Convertible Notes will have the right, at their option, to require us to repurchase their 8.0% Convertible Notes in cash at a price equal to 100% of the principal amount of the 8.0% Convertible Notes to be repurchased, plus accrued and unpaid interest to, but excluding, the fundamental change repurchase date. The pending merger with Granite is not a fundamental change under the indenture governing the 8.00% Convertible Notes. If the merger with Granite is consummated, any future conversions of the 8.0% Convertible Notes would be settled solely in shares of common stock of Granite (other than cash in lieu of any fractional shares). Asset-based revolving credit facility. As of January 31, 2018, availability under our asset-based credit facility was $100.0 million, with outstanding letters of credit amounting to $24.6 million and no borrowing outstanding, leaving Excess Availability of approximately $75.4 million. The asset-based credit facility is guaranteed by our direct and indirectly wholly-owned domestic subsidiaries, subject to certain exceptions described in the asset-based credit facility. The obligations under the asset-based credit facility are secured by a lien on substantially all of our assets and the assets of the guarantor subsidiaries, subject to certain exceptions described in the asset-based credit facility, including a pledge of up to 65.0% of the equity interest of our first tier foreign subsidiaries. The asset-based credit facility also contains a subjective acceleration clause that can be triggered if the lenders determine that we have experienced a material adverse change. If triggered by the lenders, this clause would create an Event of Default which in turn would permit the lenders to accelerate repayment of outstanding obligations. In general, during a Covenant Compliance or if an Event of Default has occurred and is continuing, all of our funds received on a daily basis will be applied to reduce amounts owing under the asset-based credit facility. Based on current projections, we do not anticipate being in a Covenant Compliance Period during the next twelve months. 11% Unsecured Notes. On March 19, 2018, we entered into a note purchase agreement with two investments funds advised by Corre Partners Management, LLC to purchase $ 71.0 million of our 11% Unsecured Notes. Corre Partners Management and its affiliated funds, including the purchasers of the 11.0% Unsecured Notes, own a portion of our 4.25% Convertible Notes and 8.00% Convertible Notes. Under the note purchase agreement, the purchasers have committed to purchase $71.0 million of our 11% Unsecured Notes due October 16, 2019 (the "11.0% Unsecured Notes") at a purchase price equal to 100% of the principal amount of the 11.0% Unsecured Notes. The closing of the purchase and sale of the 11.0% Unsecured Notes will be the earlier to occur of (i) October 1, 2018 and (ii) the fifth business day after delivery of a funding notice by us to the purchasers. As a result, if the proceeds of the 11.0% Unsecured Notes were to be used to effectively discharge the 4.25% Convertible Notes prior to July 16, 2018, we would need to refinance (1) the asset-based credit facility on or prior to April 14, 2019, (2) to the extent they are not converted into our common stock, the 8.0% Convertible Notes on May 1, 2019 and (3) the 11.0% Unsecured Notes on or prior to October 16, 2019. The commitment of the purchasers to purchase the 11.0% Unsecured Notes terminates upon the earliest to occur of: (i) a change of control (including the closing of the pending merger with Granite) and (ii) delivery to the purchasers of a notice of termination by us. We may at our option prepay the 11.0% Unsecured Notes in whole or in part at any time. The 11.0% Unsecured Notes are subject to a mandatory prepayment upon the closing of a change of control. The 11.0% Unsecured Notes are subject to an Early Payment Event Fee if the 11.0% Unsecured Notes are repaid less than 90 days after the 11.0% Unsecured Notes are issued. The amount of the Early Payment Event Fee will be equal to the excess, if any, of (x) 90 days of accrued interest on the principal amount repaid, over (y) the amount of interest accrued and paid or payable with respect to the principal amount repaid from the date of issuance to and including the date of the repayment. There are no covenants applicable to us under the note purchase agreement so long as: (i) the 11.0% Unsecured Notes have not been issued, (ii) any of the 8.00% Convertible Notes are outstanding and (iii) none of the provisions of the indenture governing the 8.00% Convertible Notes have been amended or waived. After the 11.0% Unsecured Notes have been issued, we will be subject to certain covenants, including, delivery of financial statements and other reports, compliance with material contracts and applicable laws, and maintenance of corporate existence, insurance and properties. In addition, after the earliest date that (i) none of the 8.00% Convertible Notes are outstanding or (ii) all or any of the provisions of the indenture governing the 8.00% Convertible Notes are no longer in effect or have been amended or waived, we will be subject to negative covenants related to indebtedness, liens, sale and leaseback transactions, asset sales, dividends and restricted payments, transactions with affiliates, and maximum ratio of funded indebtedness to EBITDA. Potential Refinancing of Convertible Notes. Prior to August 15, 2018, we may elect to issue the 11.0% Unsecured Notes and use the proceeds from the issuance of the 11.0% Unsecured Notes to effectively discharge the 4.25% Convertible Notes, in which case the maturity date of the 8.0% Convertible Notes would remain May 1, 2019. As a result, if the proceeds of the 11.0% Unsecured Notes were to be used to effectively discharge the 4.25% Convertible Notes prior to July 16, 2018, we would need to refinance (1) the asset-based credit facility on or prior to April 14, 2019, (2) to the extent they are not converted into our common stock, the 8.0% Convertible Notes on May 1, 2019 and (3) the 11.0% Unsecured Notes on or prior to October 16, 2019.
the 4.25% Convertible Notes at maturity. In this case, we would seek to extend or refinance our asset-based credit facility prior to July 16, 2018.